Ivan Ellen gets a bottom scrub! 'Juan Ferrer' memorial stone appeal. 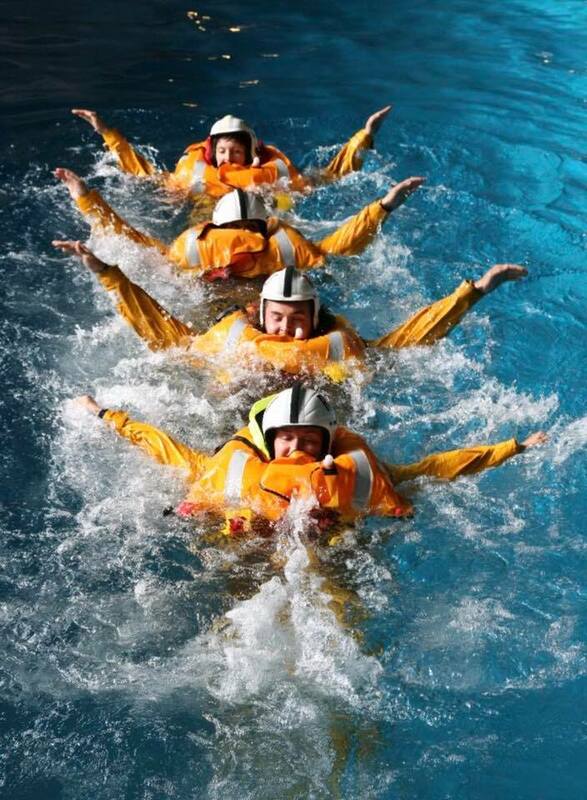 Tom Ritchie training at RNLI Sea Survival Centre. Geevor Charity Tractor & 4x4 Road Run. 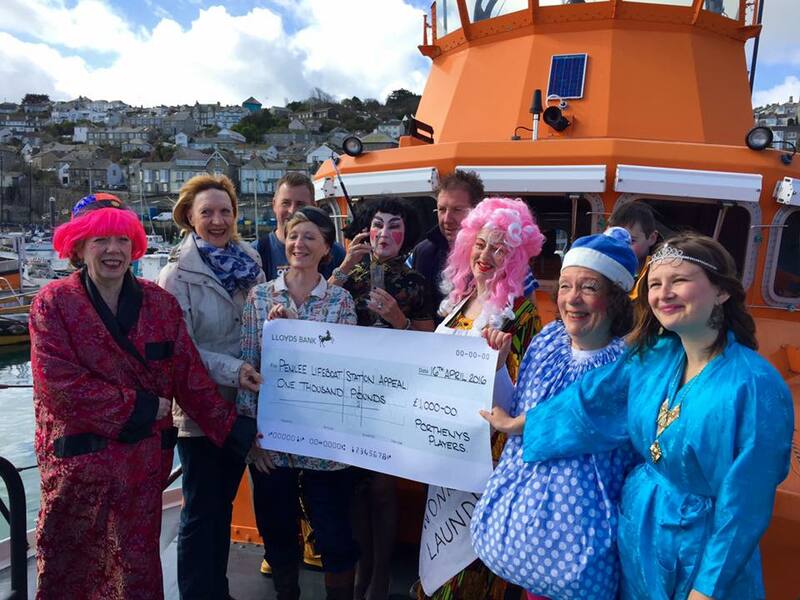 Over £500 raised for the Penlee Appeal - Thanks! Proposed plans for new lifeboat station released. Another amazing cheque from Paddlecreast. Good news about our new station build. Trevelyan's Gold Medal missing, suspected stolen. 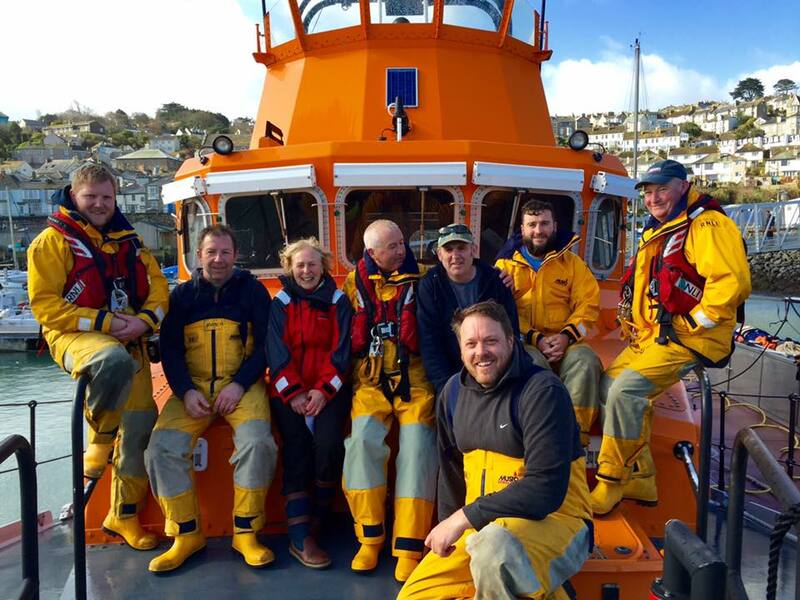 Crew day and Annual Blessing service at Mousehole. Spirit of Mount's Bay Festival Cheque presentation. 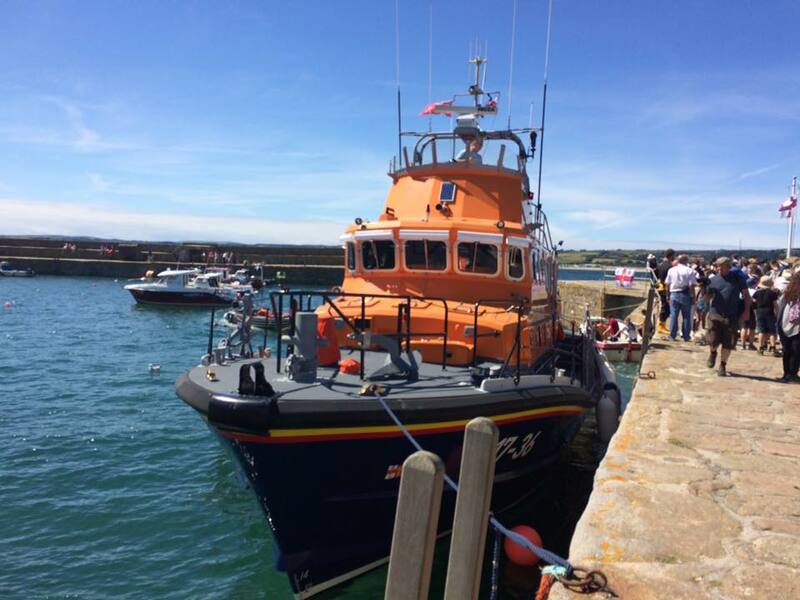 Porthleven lifeboat day a great success. 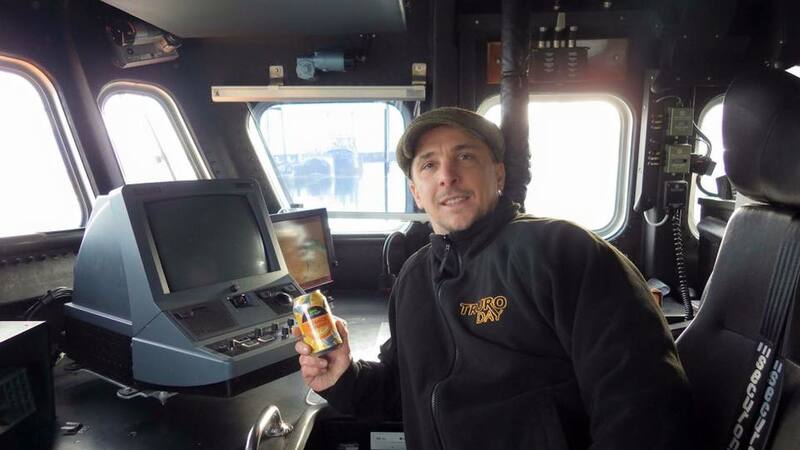 Penlee Crewmember celebrates 20 years. The 'RNLB Mollie and Ivor Dent' arrives at Penlee. 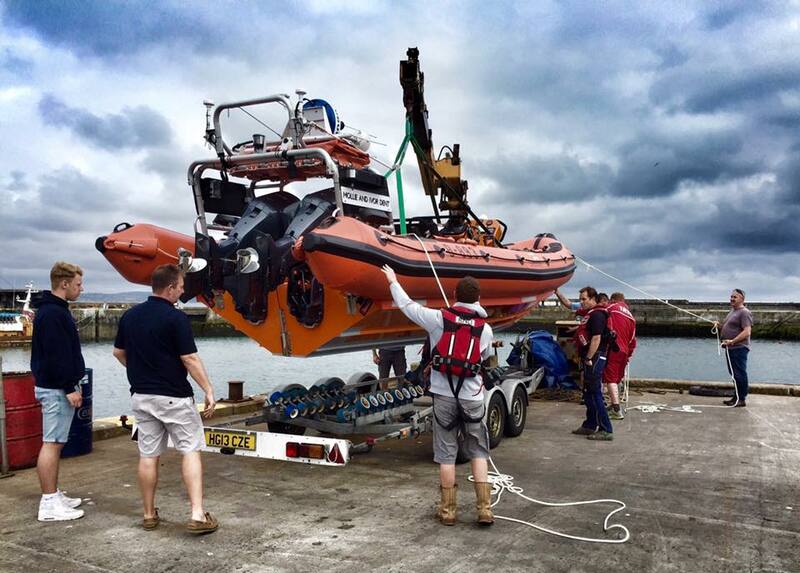 Penlee awaits delivery of a new Atlantic 85 class. Our Facebook page hits 16,000 likes! 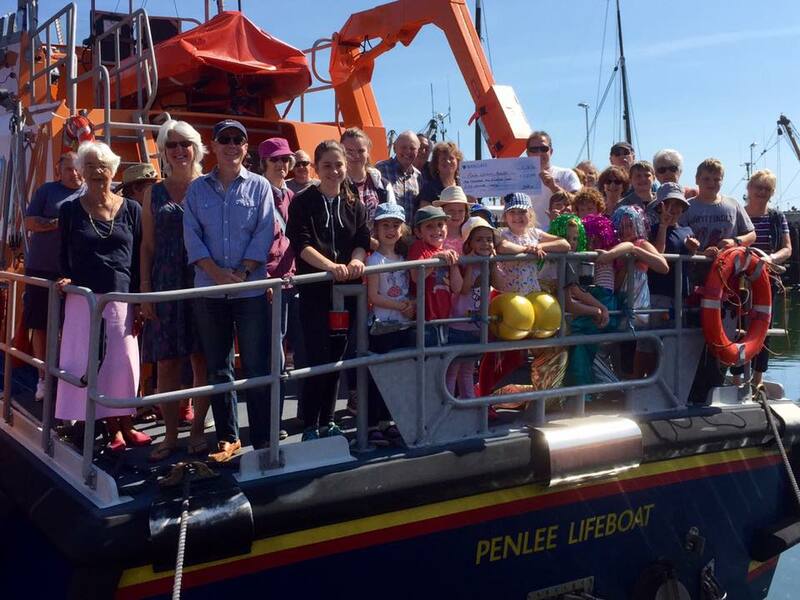 Penlee wins a share of the Community Cashback thanks to you! Seven launches in seven days! 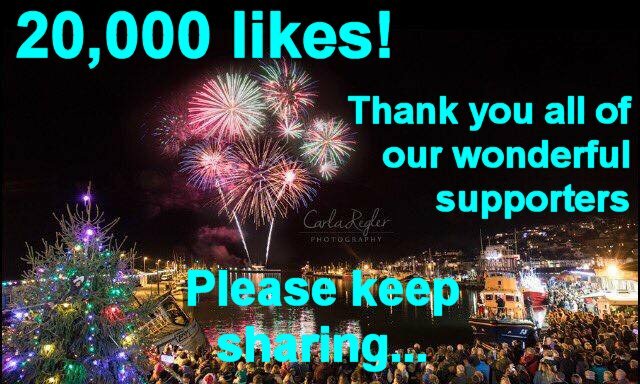 Penlee Facebook page hits 15,000 likes! 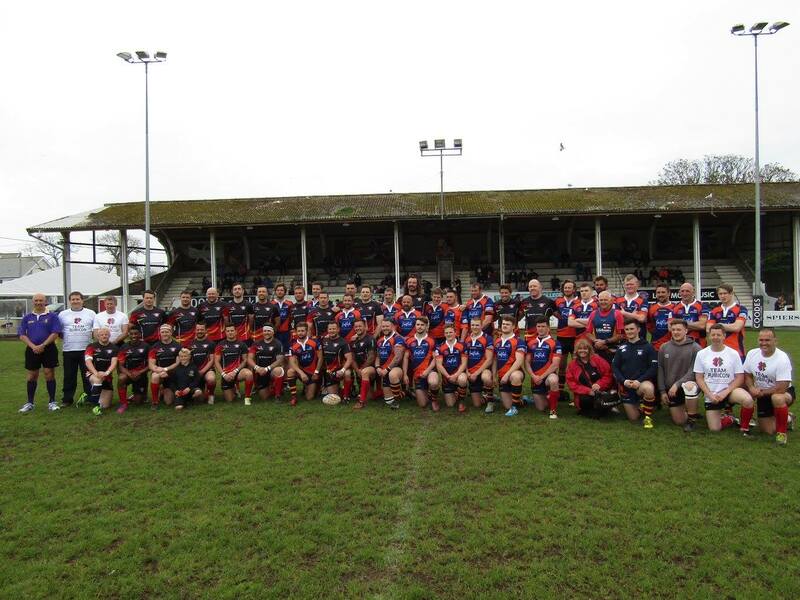 Annual RNLI vs CFRS rugby match with everyone a winner! 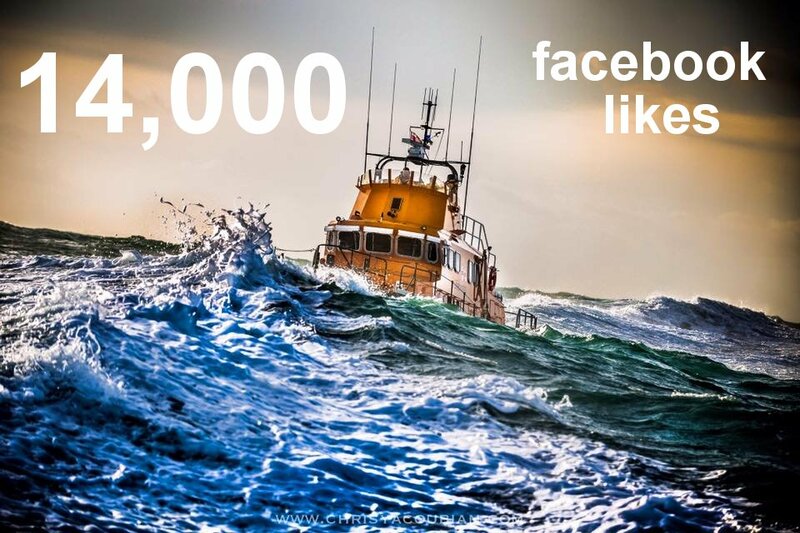 Penlee Facebook page hits 14,000 likes! Rob went 'Dry for January' raising a staggering £726.01 for our appeal! A huge thank you to you all as our facebook page clicked over 20,000 likes in the evening of 22nd Dec.
As the big day fast approaches we would like to send you our good wishes for a happy and peaceful Christmas. Thank you for your kind Facebook comments, likes, shares, and encouraging messages throughout the year, they are all much appreciated. It's always good to know that you are all behind us on every single 'shout' - keep up the good work! Happy Christmas one and all. Today members of the Penlee Lifeboat Station Heritage team remembered the crew of the Juan Ferrer who tragically lost their lives at sea in October 1963. A Christmas wreath was placed on their grave with the newly erected memorial stone. Many thanks to your support for allowing this exquisite memorial stone to be erected. Thanks to the generosity of a dedicated RNLI supporter the Royal National Lifeboat Institution is now offering a reward of £1,000 for the safe return of the historic gold medal posthumously awarded to Trevelyan Richards, the Coxswain of the Penlee lifeboat 'Solomon Browne'. The charity is especially interested in hearing from the member of the public who contacted Dorset Police anonymously with information and are appealing for them to get back in touch. Please share and spread the word. On the Slip at Newlyn having a good clean, The new anti-fouling that was painted on during her recent major refit proved to be a great success cutting the time required to clean the bottom by several hours. Our Fundraising Chairman, Eric Taylor, and RNLI Community Fundraising Manager, Ben Bowskill, collected a £300 cheque from Honiton & District Lions Club. This money was raised by Lion David Rickard, the clubs very own Cornishman, who has been selling books to raise money for our new lifeboat station in Newlyn. David, aged 75yrs, (third from left) has already raised more than £4,000 for the RNLI in memory of his late mother, Mary Rickard. He has done this through working local paper rounds and saving the pay and tips to give to charity. David has done this for more than 10 years, and has already visited Penlee twice. He will be returning on 26 January 2017 to present another cheque for £1,500. 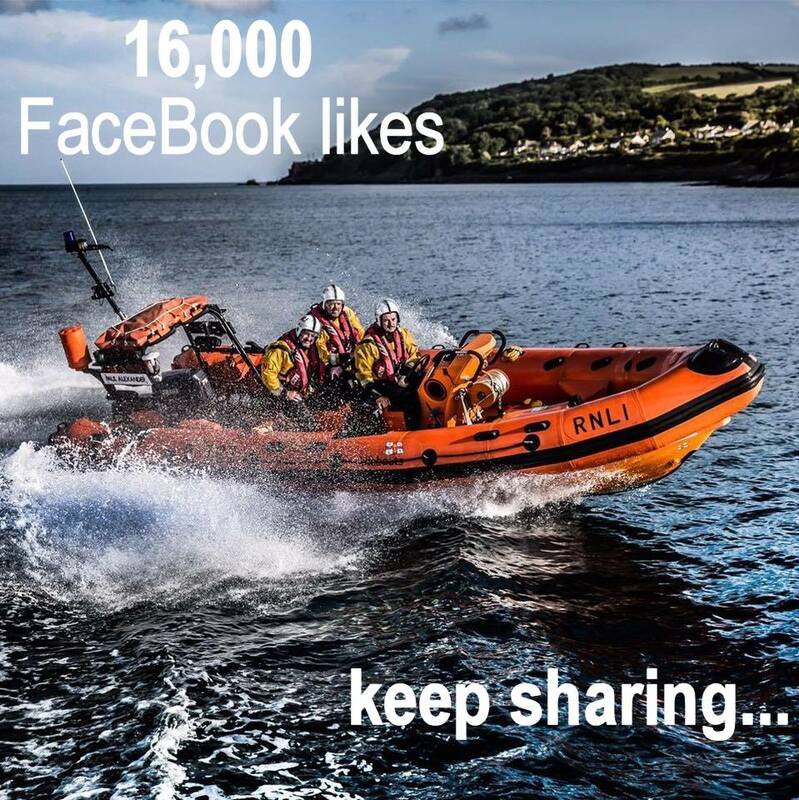 Celebrations within the Penlee Media team today as our facebook page topped 19,000 likes. We've been watching it grow steadily over the past few weeks, thinking we might be lucky enough to have 19,000 likes by the end of the year, but a 'flurry' of interest over the past few days has caught us by surprise. Have another go at inviting your friends to like us, we might top 20,000 by the end of the year! 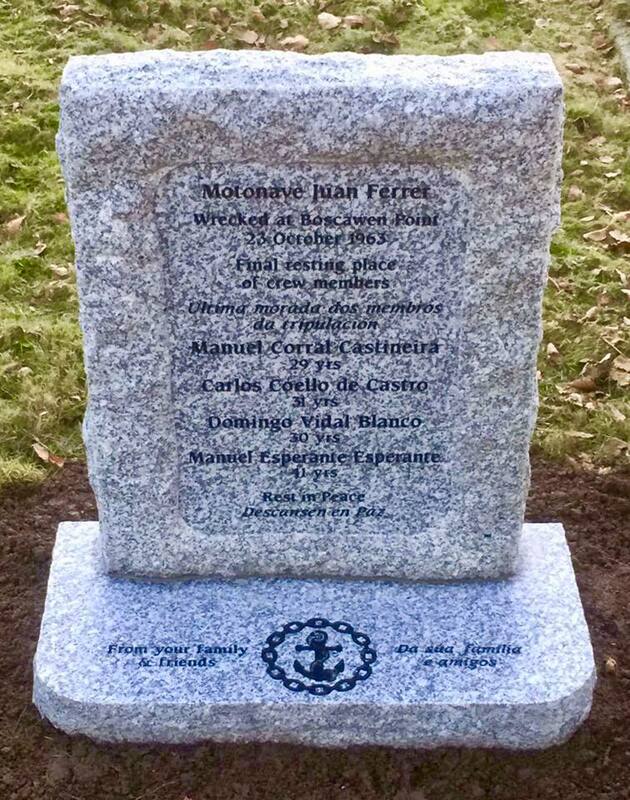 The Juan Ferrer memorial stone is now in place at Penzance Cemetery. It will be blessed and dedicated at a later date when family and friends from Galicia can be present. We are hugely indebted to Sarah and Victor at Long Rock Memorials for their help, advice and guidance. They kindly gave their work free of charge, a very generous and thoughtful gesture which is much appreciated. Thank you to everyone who donated so generously to the fundraising appeal, without you this wouldn't have happened. Huge thanks to the RNLI City of Manchester Branch who have raised another £1,000 towards our station appeal. The generosity of our supporters in a 'Land-locked' branch and the dedication of our volunteers is what makes the RNLI as great as it is. Well done folks, we are so lucky to have your continued support. The hardworking, loyal and dedicated volunteers who make up the RNLI Porthleven & District Branch, 8 people in total, have raised another staggering £9,251 towards our station appeal, plus £533 in souvenir sales which goes to the RNLI central fund. It was an amazingly successful day in perfect Cornish sunshine which made the 9 months of planning, hard work, and sleepless nights well worth it! 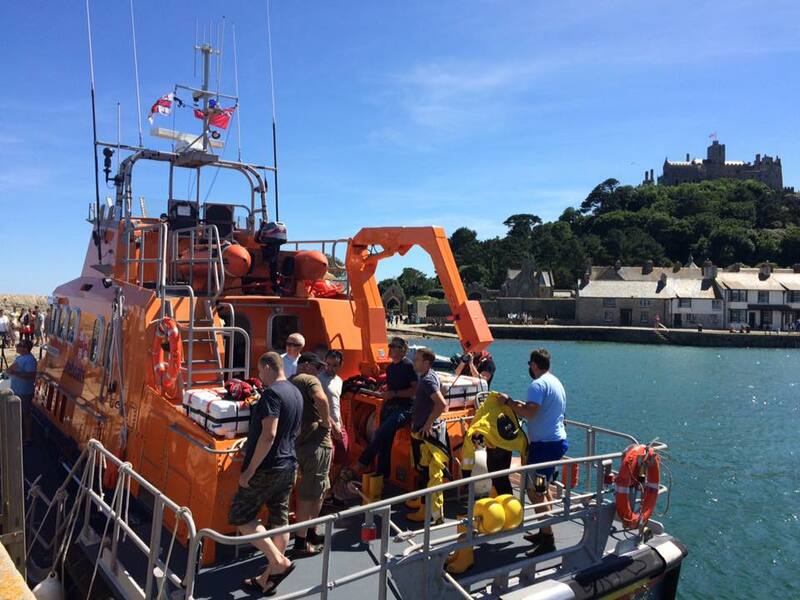 Our sincere thanks go to everyone who was involved in the planning of this tremendous lifeboat day, and to all the amazing visitors who donated so generously. Well done to the Trad Academy Sea Shanty Choir who gave an amazing performance on a blustery Sunday afternoon at the old boathouse, Penlee Point. Their rousing shanties were enjoyed by everyone and the pasties were great! Thanks to all of those who attended and helped organise the event to support the Trad Academy Sea Shanty Choir and of course Penlee lifeboat. Huge thanks to everyone that came and supported the RNLI Fish Supper last night, and to our hosts at The Godolphin Arms. 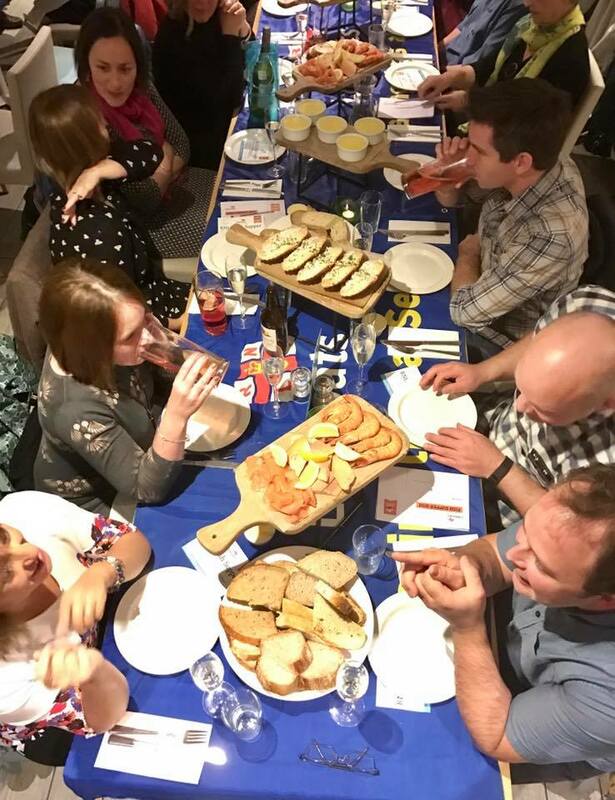 The night started with a fish demonstration by Matthew Stevens, followed by a delicious fish platter starter with crab supplied by The Real Cornish Crab Company, a delicious main of hake provided by Matthew Stevens, and for those that could manage it a lemon posset dessert! In addition to ticket sales, the raffle and auction raised an additional £375 on the night with some great prizes being won. We are still counting the money but well over £1,000 is in the fundraising pot. Slapdash Trio kept the crowd entertained, with the night being a huge success! Our volunteers are ready to brave anything the sea can throw at them. But the biggest danger the RNLI faces right now? It’s losing touch with you. You may have heard that an important change is afoot at the RNLI – one that will put supporters like you in charge of how we contact you. We’re the first UK-based charity to make this change – it’s the right thing to do for our supporters – but we need your help. You can look at our social media any time, but soon, we won't contact you via post, email or phone unless you’ve chosen to ‘opt in’ to hear from us – even if you’re an existing supporter. Our volunteer lifesavers rely on your continued support to help keep the British and Irish coasts safe. 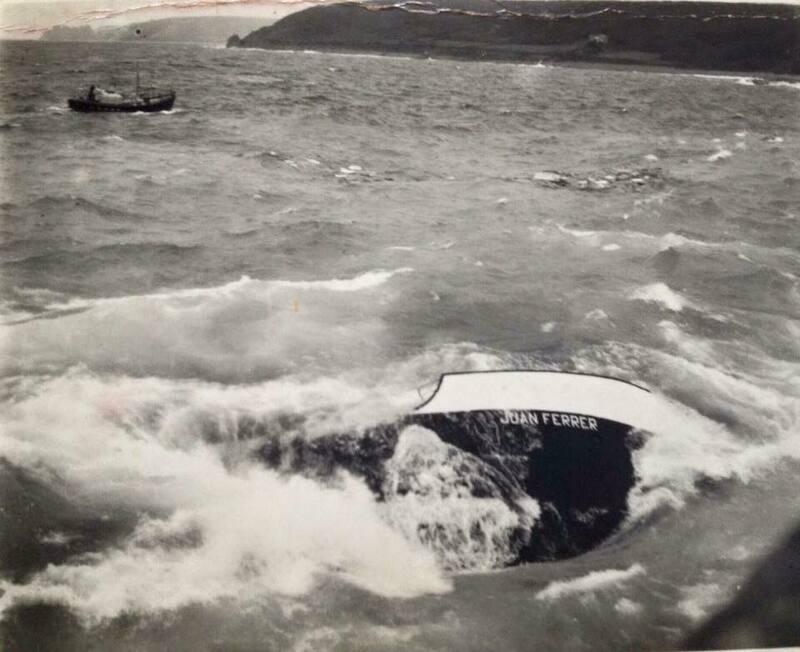 In the early hours of the 23rd October,1963 during a south-westerly gale and poor visibility the MV Juan Ferrer, a 640 tonne Spanish coaster ran aground on rocks at Boscawen Point near Tater Du. The radio was dead, the ships lifeboats were out of action and the Juan Ferrer, fatally gashed by the rocks, was sinking fast. Eleven members of the vessel's crew of 15 did not live to tell the tale of what happened next. Only four - including the Juan Ferrer's 32-year old captain - could recount the desperate battle against a very angry sea. 53 years later, during research for the new Penlee Lifeboat History book, our Heritage Team at Penlee Lifeboat Station, Elaine Trethowan & Martin Brockman, have located the unmarked mass grave of four of those young men who drowned off the coast of Cornwall. 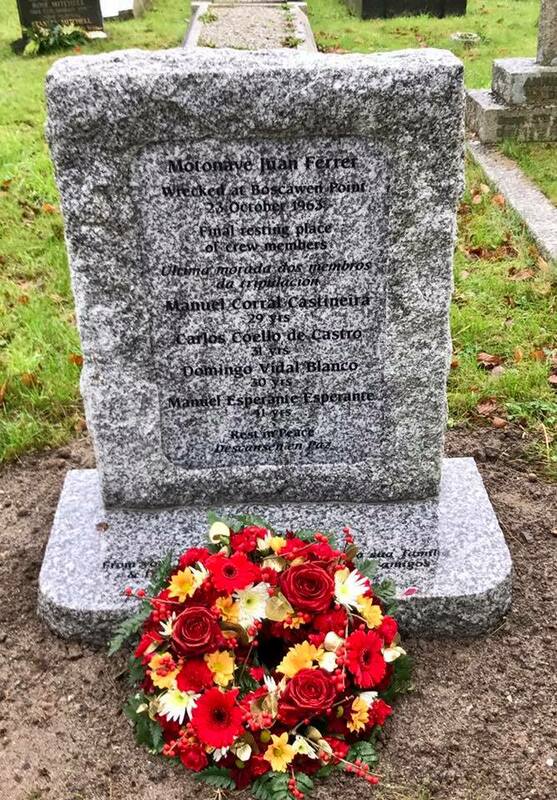 With the support of the remaining family and friends, in Galicia, Spain, who were not aware of the final resting place of their loved ones, it is hoped that enough money can be raised to place a permanent memorial on their grave at Penzance Cemetery. One of our newest volunteer crew members at Penlee has just had a vital part of his crew training funded by Lloyd’s Register Foundation. Tom Ritchie, 29, who recently moved from Dundonald in Scotland to Penzance, travelled to the RNLI College in Poole, Dorset, where he completed the charity’s Trainee Crew Course. A key part of the course is the sea survival element, which enables new volunteer crew to be trained in a variety of crucial subjects including how to ‘abandon ship’ with a 4m jump into water; team survival swimming and coping in a liferaft in simulated darkness; how to deal with fires aboard lifeboats; how to right a capsized inshore lifeboat; and the importance of lifejackets. Training took place in the Sea Survival Centre at the charity’s college, which includes a 25m wave-generating survival tank, allowing trainees to experience first-hand some of the scenarios they may encounter at sea should they ever need to abandon their lifeboat. 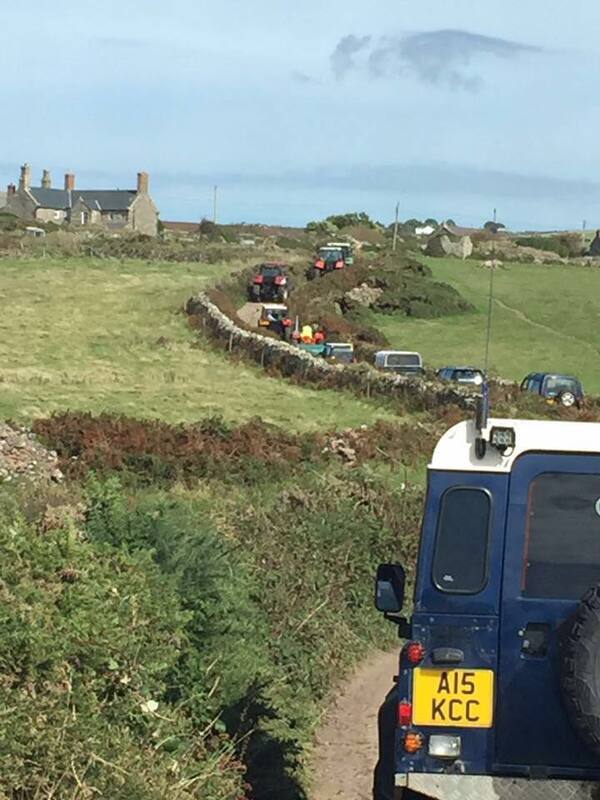 Huge thanks to everyone who took part in the recent Geevor Charity Tractor & 4x4 Road Run, it looks like you all had a fun day! We really appreciate your support and the generous donation to our appeal. 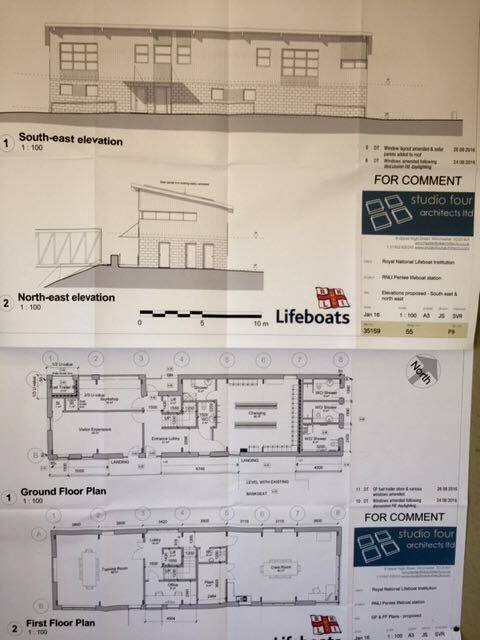 The final plans for our new lifeboat station are now on display at Newlyn. Please call into the station between 10.00am & 12.00 midday, Monday to Friday, and take a look. We would really appreciate your feedback, comments and support. Pop in and see Patch and he will point you in the right direction. A full public consultation/question and answer session will take place in October. Date to be arranged. On Wed 7th Sept we had a visit from Richard Uren of Paddlecrest Coaching who presented a huge £750 cheque to Coxswain Patch Harvey. The money was raised in conjunction with Penzance Canoe Club who organised a sea kayak meet - 70 kayaks from across the UK travelled to Cornwall and supported the event. Many thanks to you all for your generous donations and continued support. Some really good news - things are moving in the right direction with our plans for a new station and visitor centre in Newlyn. The RNLI Estates team hope to submit a planning application for approval later this month. 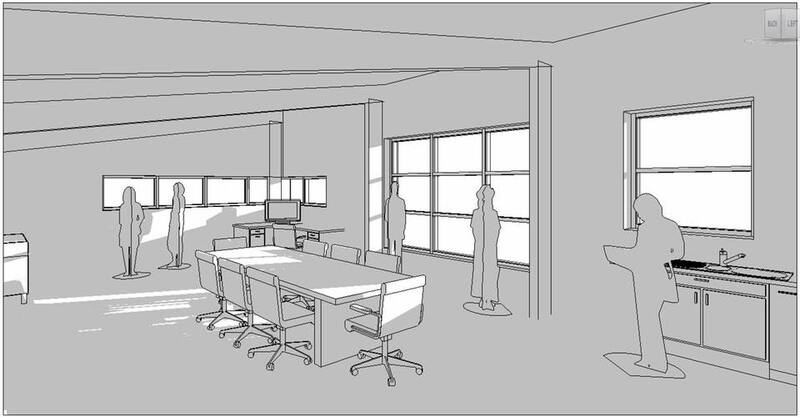 In the meantime, before the drawings are submitted, we will be putting the plans on display at the station so that you can pop in for a look. Watch out for further posts on a start date. Once we have submitted our planning application, a community meeting will take place in Newlyn, probably in late October, to give the public an opportunity to comment and ask questions about the proposals. It is with deep sadness that we share this news with you all. The RNLI gold medal posthumously awarded to William Trevelyan Richards, Coxswain of the ill fated lifeboat 'Solomon Browne' has gone missing, suspected stolen. The medal was recently identified as missing from a dedicated secure facility at the charity's head office in Poole. Despite an extensive search the medal is still missing and police have been notified of a suspected theft. This medal is of huge historical importance to our station, to the families of the crew who lost their lives so heroically, to the wider community of Mousehole & Newlyn, the RNLI and beyond. Trevelyan's gold medal is irreplaceable and our priority is to see it returned to his family as soon as possible. 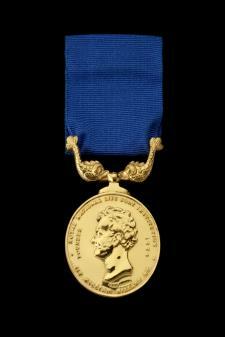 This is the ONLY gold medal in the history of the RNLI awarded posthumously. 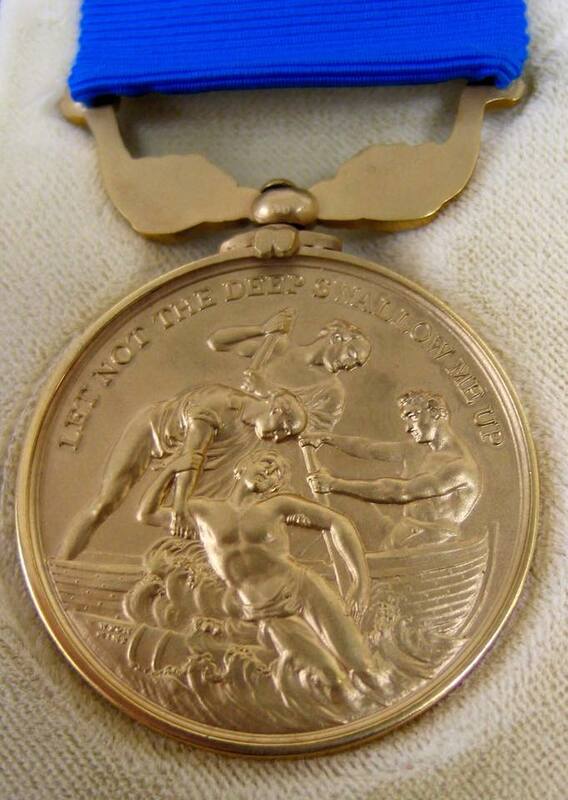 If you have any information as to the current whereabouts of this medal, or can assist in anyway please contact Dorset Police by calling 101, quoting incident number 02:136. Information can also be reported anonymously to CRIMESTOPPERS on 0800 555111, or via the RNLI on 0300 300 9990. 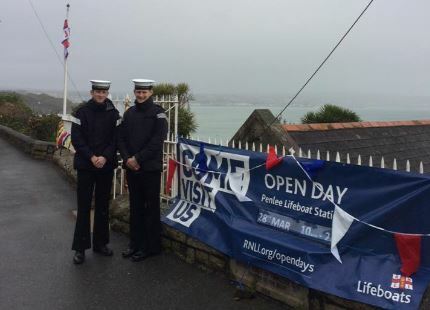 To start the day off, the Penlee Heritage team opened the old lifeboat station at Penlee Point between 11.00am & 2.00pm. 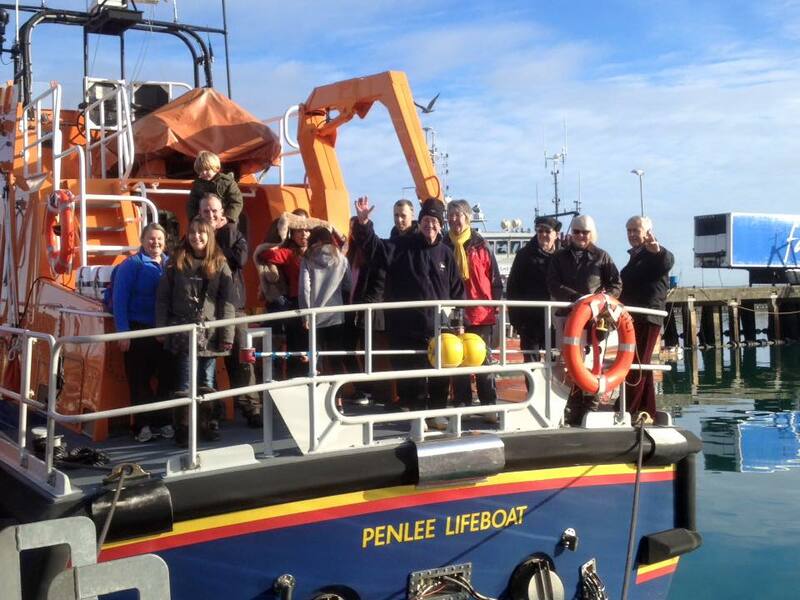 They welcomed over 250 visitors who were all extremely generous, donating £236 towards the Penlee Lifeboat Crew Day. 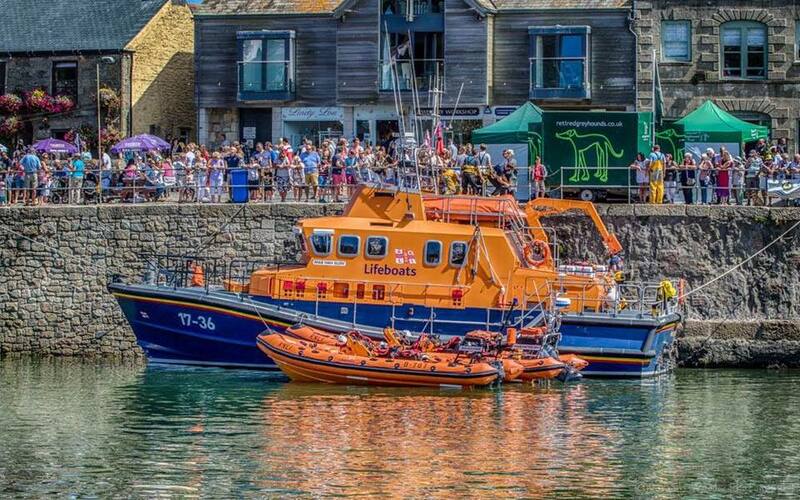 At noon, things started over at Mousehole on the Quay, the crew ran a BBQ and the Branch fundraisers manned stalls selling RNLI souvenirs and Penlee branded merchandise. The Penlee lifeboats arrived at 5pm and gave a spectacular SAR display with the new Bristow's Sikorsky S-92 (Coastguard 924), before leaving for Newlyn and readying the boats for the main event of the day. 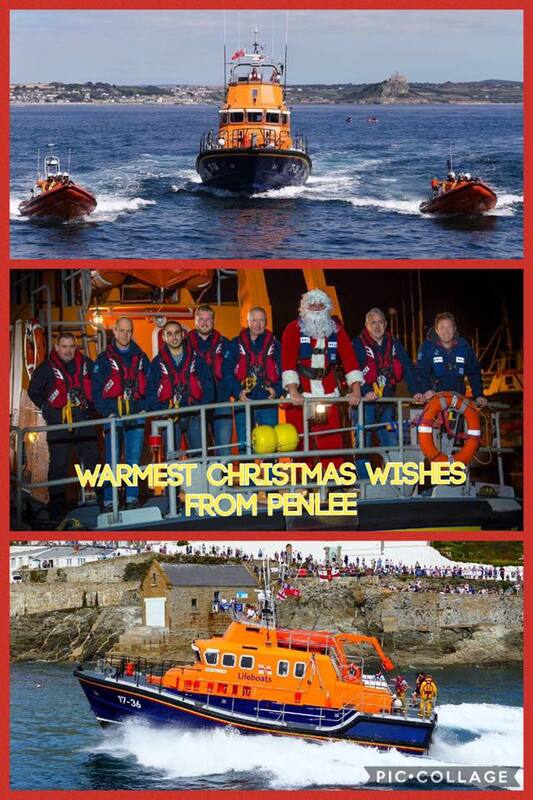 The annual open air blessing service of the Penlee Lifeboats and Crew. 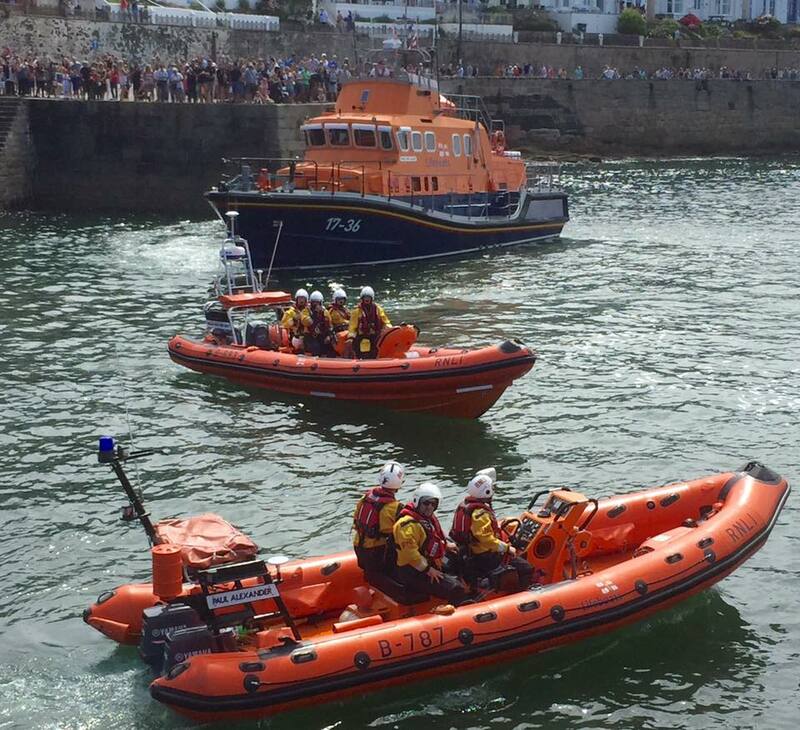 To a packed Quay the lifeboats arrived, the service conduced by the 2 chaplains of Penlee Lifeboat with the assistance of the Seaman's Mission, Crew members and Mousehole Male Voice Choir. The totals are still being counted, but when we have them we will let you know. Thank you all for your continued support - without you we could not provide this essential lifesaving service! On Monday 15th August we were joined by three beautiful mermaids, 30 children from the Penlee Cluster Holiday Club, and the dedicated and very talented group of volunteers who organised this year's Spirit of Mount's Bay Festival at St Mary's Church, Penzance. The festival raised an amazing £2,500 which was split between our appeal and the children's Playzone in Penzance. A cheque for £1,250 was presented to Patch by the festival organiser, Lynn Kernow - a tour of the Ivan Ellen and station followed. We really appreciate the hard work that went into this festival, the money raised takes us one step closer to our appeal target. What a fantastic time we've all had at Porthleven Lifeboat Day this year. 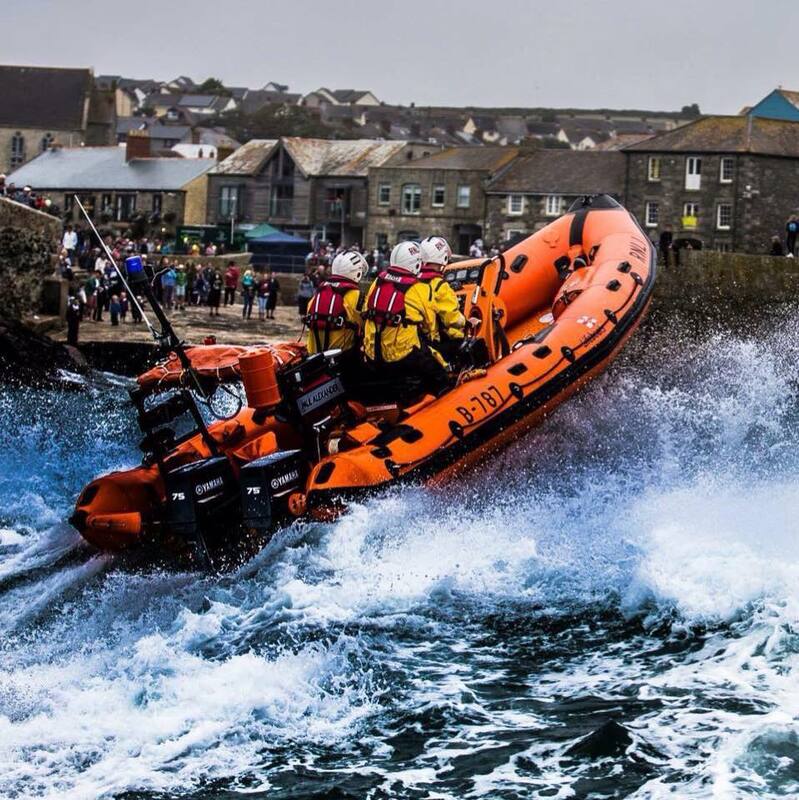 Huge thanks go to the amazing volunteers at Porthleven & District RNLI who have worked tirelessly throughout the year to ensure that Lifeboat Day was such a huge success. 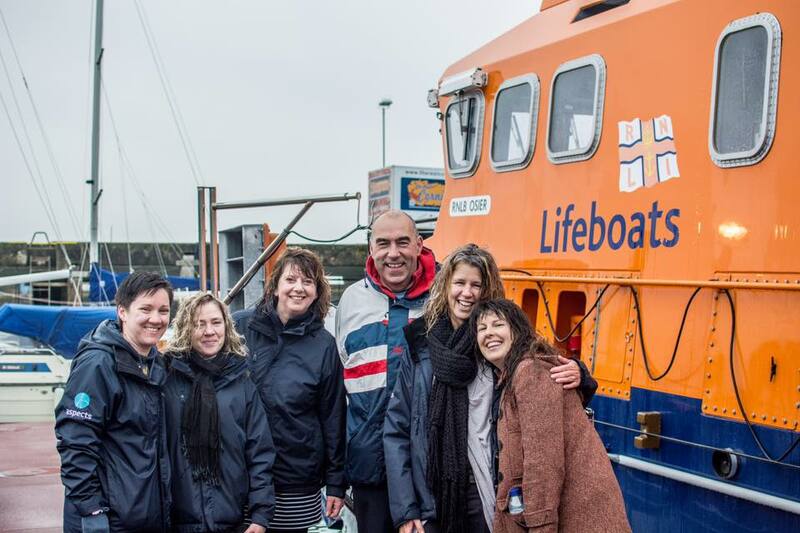 Our thanks must also go to all the other lifeboat stations who supported the event, and last but not least, to all our amazing supporters who visited Porthleven and donated so generously. On Saturday 13th August 2016 one of our longest serving volunteer crew members, David Pascoe, was awarded his 20 year service badge by Tom Mansell, RNLl Divisional Operations Manager. David, a Newlyn fisherman and boat owner, joined the Penlee Lifeboat in 1996 and progressed to Deputy 2nd Coxswain and Inshore Lifeboat Helm in 2001. He is now 2nd Coxswain on the all-weather lifeboat 'Ivan Ellen', and a Senior Helm of our Inshore Lifeboat, the 'Mollie and Ivor Dent'. During his years at Penlee, David has served under 2 Penlee Coxswains and attended hundreds of shouts. David's nephew, Thomas Pascoe aged 19 years, is currently a trainee at Penlee. He is the newest and youngest member of our crew and is definitely following in his Uncle's footsteps - congratulations and well done Dave! Penlee RNLI’s new Atlantic 85 Class Inshore Lifeboat Mollie and Ivor Dent - B893 arrived at Newlyn on Wednesday 10th August 2016. The Mollie and Ivor Dent was built at the Inshore Lifeboat Centre, East Cowes, Isle of Wight, at a cost of £215,000. Her build costs were funded after a generous legacy from the late Mollie Dent, a lifetime supporter of the RNLI from Newbury, Berkshire. 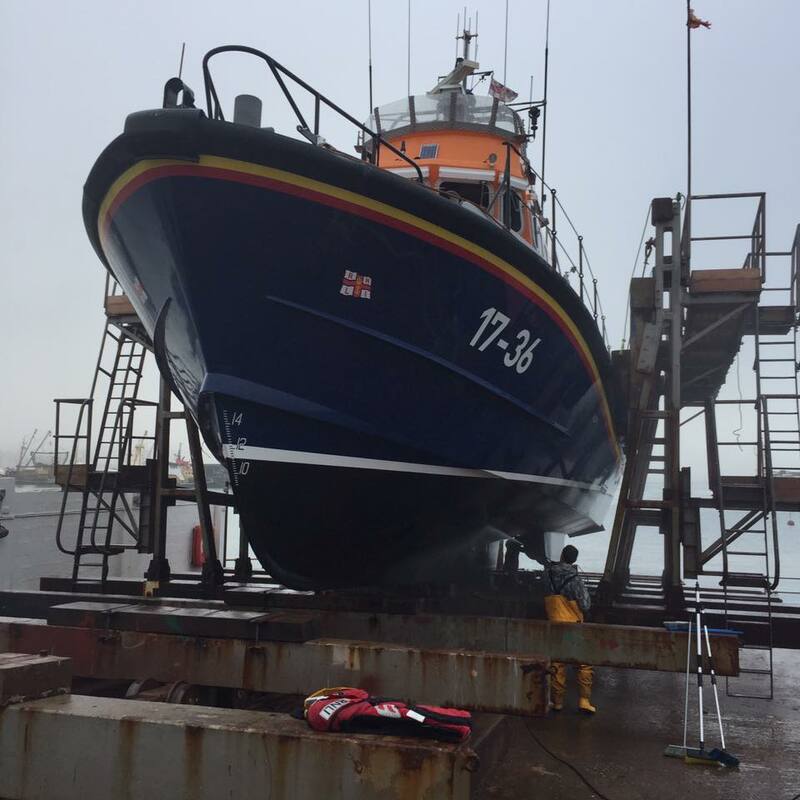 She will replace the Atlantic 75 Inshore Lifeboat, Paul Alexander, which arrived on station in 2003 – 367 services later with 21 lives saved its time for her to move on to pastures new. Intensive local training will commence immediately, ensuring that all volunteer crewmen at Penlee are familiarised with the new Inshore lifeboat. The Atlantic 85 class lifeboat carries four crew members, is powered by two 115hp engines and has a stronger hull and greater top speed. On board is a full suite of communication and electronic navigation aids, and the added radar allows the crew to operate more effectively in poor visibility. Another chapter of our history will begin on Wednesday 10th August in the afternoon when we take delivery of a new Atlantic 85 class Inshore lifeboat, the Mollie and Ivor Dent. She will replace our current Atlantic 75 Inshore lifeboat, Paul Alexander. 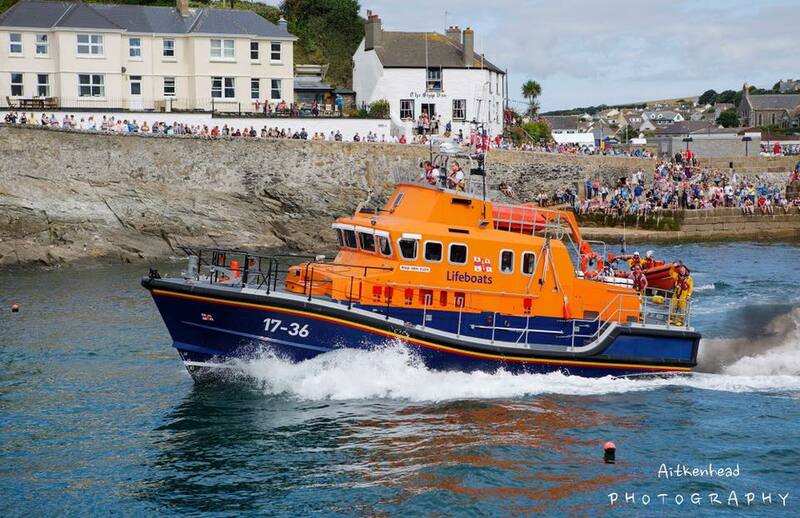 Operational commitments permitting, we hope to take all three lifeboats across the bay to Porthleven Lifeboat Day on Sunday, 14th August and at the annual blessing service at Mousehole on Sunday 21st August 14. RNLI stock photo of the Atlantic 85 class lifeboat. 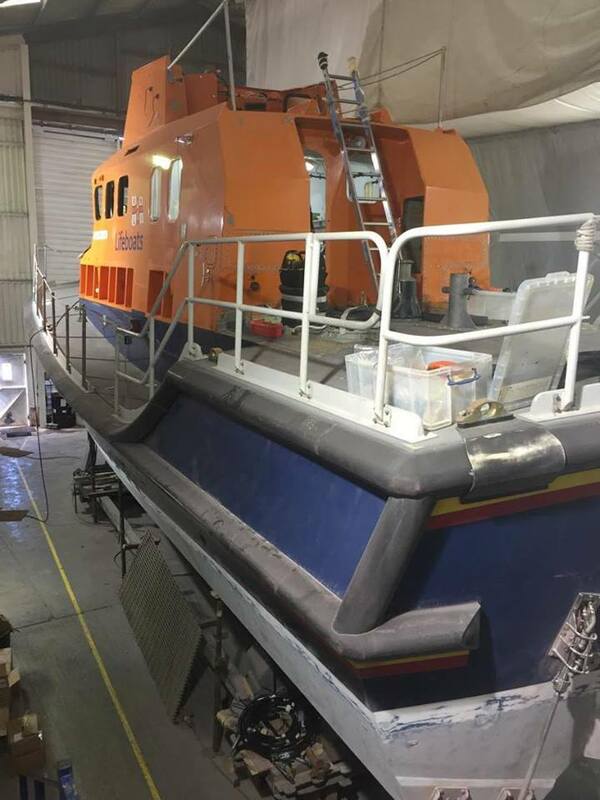 Our Heritage officer, Martin Brockman and station mechanic, Tony Rendle, showed them around the facility at Newlyn, a tour of the lifeboats and then Martin took them to the old lifeboat station at Penlee Point for a VIP tour. 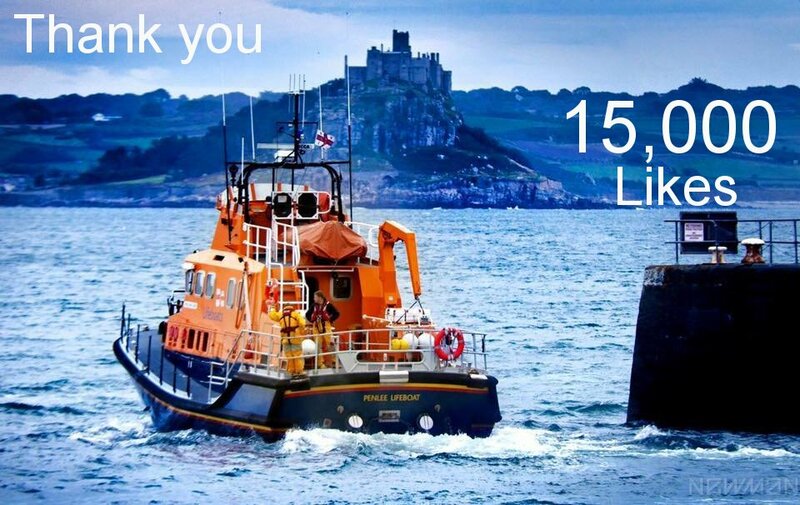 We would like to thank all of our supporters who visited the lifeboat day on St.Michael's Mount and also those who dug deep and put money in our collecting boxes. We hope to run the 'Golden Ticket' competition again soon, so please keep an eye on our social media pages and Good luck! 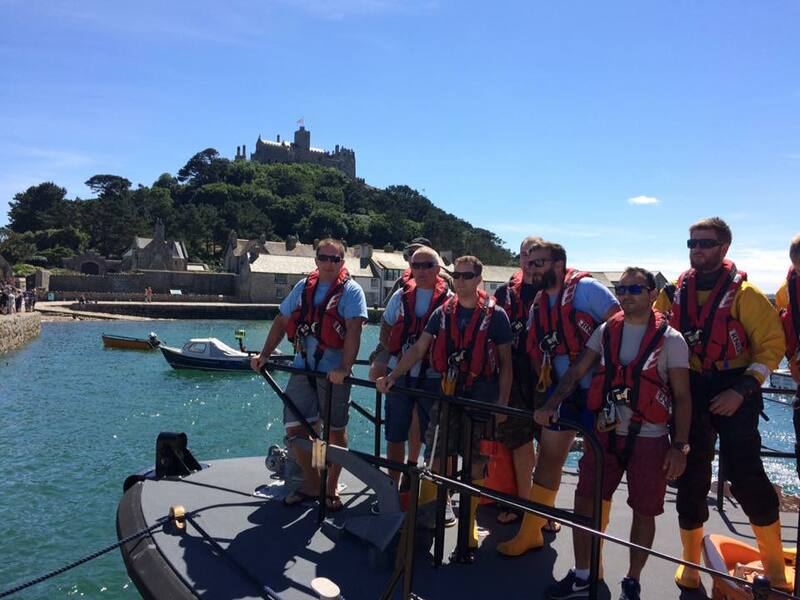 What an amazing time we had on St. Michael's Mount on Sunday 31st July. In perfect summer sunshine hundreds of visitors viewed the 'Ivan Ellen' & 'Paul Alexander' lifeboats, and our photographic display in the Barge House. 200 children were pleased to receive a sea safety bag, and two lucky families won a 'Golden Ticket' inviting them to a VIP tour of the lifeboats and facilities in Newlyn. On the mainland, Geoffrey and the 'Saturday Gang' did a roaring trade with Cream Teas, Cakes and the raffle - together with RNLI souvenirs over £700 was raised. Our grateful thanks go to St Aubyn Estates for supporting our station appeal, to all the staff on St Michael's Mount who gave us such a warm welcome, to Penzance Sea Cadets for their invaluable help, to Geoffrey and the 'Saturday Gang' for another fantastic fundraiser, to all our dedicated volunteers who willingly gave their time, and last but not least, to everyone who continue to donate so generously to the Penlee Lifeboat Station Appeal. 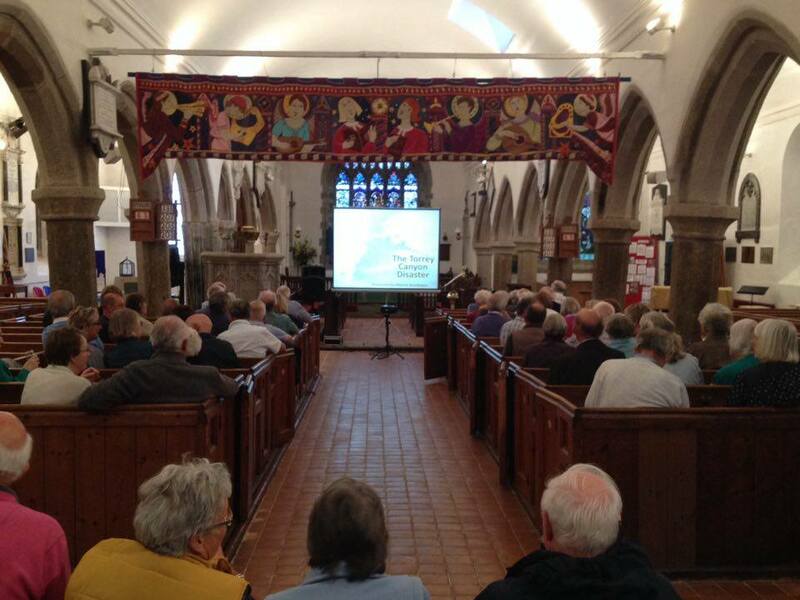 The Penlee Heritage Officer, Martin Brockman, presented his illustrated talk on the Torrey Canyon Disaster at Paul Church. The church is raising funds towards the repair of one of it's iconic stained glass windows. Paul Church was packed with a very interactive audience. Some of whom were involved in the clean-up after the disaster and also a retired crewmember of the Solomon Browne lifeboat, Nim Bawden. Nim shared some of his memories with the audience and also some of the fun he had with Martin's father, Nigel, who was also a Penlee crewmember attending to the Torrey Canyon and was lost in the Penlee disaster of 1981. Thank you all for attending and supporting our events. We've done it, our Facebook page has 16,000 likes! all thanks to YOU, our wonderful supporters. 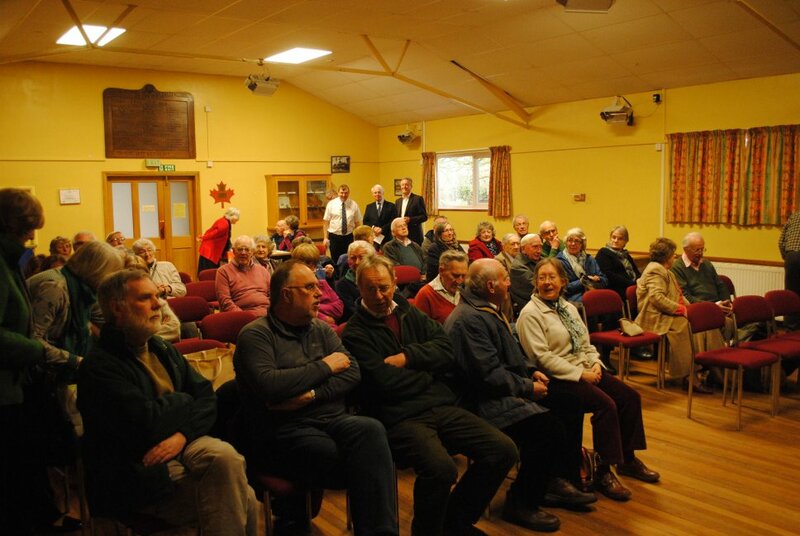 Our Volunteer Visits officer, Martin Brockman, was invited along to present his Torrey Canyon Disaster talk at the Cornubian Masonic Lodge, Hayle. There were well over 60 people there, including freemasons, their families, friends and public who had seen the event publicised. The talk was followed by a homemade pasty and a raffle. 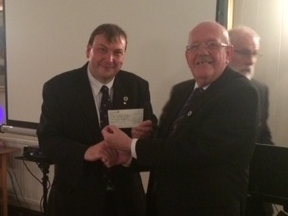 The Worshipful Master of the Lodge, Worshipful Brother Stuart Wordsworth presented Martin with a cheque for £333. This is not the first time that the Cornubian Lodge have donated to our appeal, in June 2015 they gave a donation of £660 making their contribution just short of £1000. In total the freemasons of Cornwall have donated £5,000 - that's 2.5% of our local target! Registration for the 2016 'Around the Mount Swim' on Saturday, 10th September is open! The very first competitor to register was 14 year old Lucy Rendle, a student at Mount's Bay School, and daughter of our lifeboat mechanic, Tony Rendle. Lucy, who swims for Penzance, wanted to take part last year but she wasn't old enough. We are thrilled that she's taking part this year. 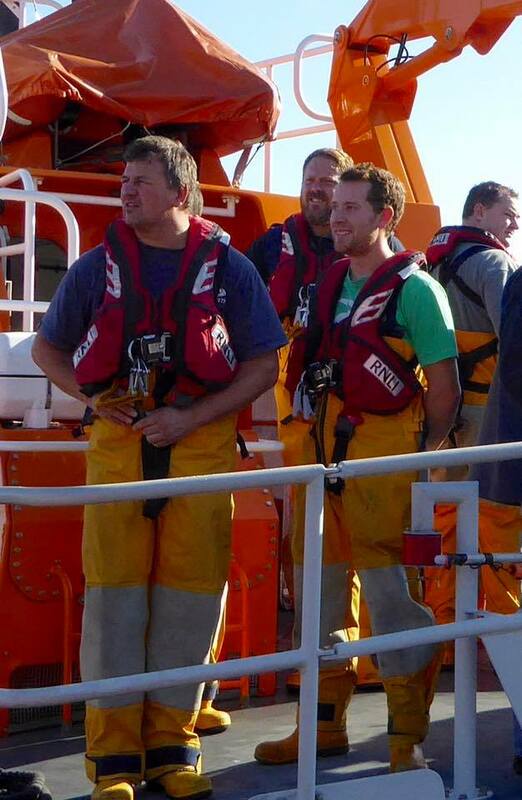 A huge welcome awaited Steve McAllister at Penlee Lifeboat Station. 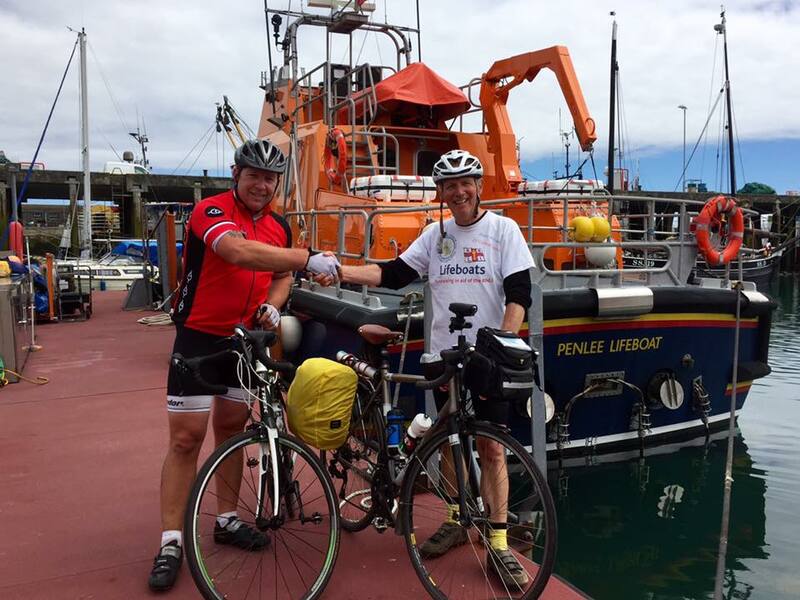 8,000 miles via 237 lifeboat stations is what Steve's RNLI Coastal Cycle challenge is all about. He's got over 5,000 miles under his belt so far, with the Channel Islands, Isle of Man, and Ireland still to do. Patch cycled out to meet Steve, and despite heavy traffic, they arrived back in Newlyn just after midday where Steve was greeted by his wife, three brothers and other family members. Brew with the crew, pasties and a look over the Ivan Ellen lifeboat followed. Steve was completely overwhelmed by the welcome he received and said, 'This has been the highlight of my journey and I was absolutely thrilled to be joined by Patch. It's an amazing feeling to have closed the last link of the chain around the mainland of Britain'. Steve will now have a well earned break from cycling but will be back on his bike in the Autumn for his cycle around Ireland. We wish him all the very best on his onward journey! The continued support of the volunteers, donors and customers of the Rotary Shop in Penzance resulted in this donation to the Penlee RNLI of £500. The money will help towards the new crew facilities in Newlyn, where presently cramped conditions need to be replaced. 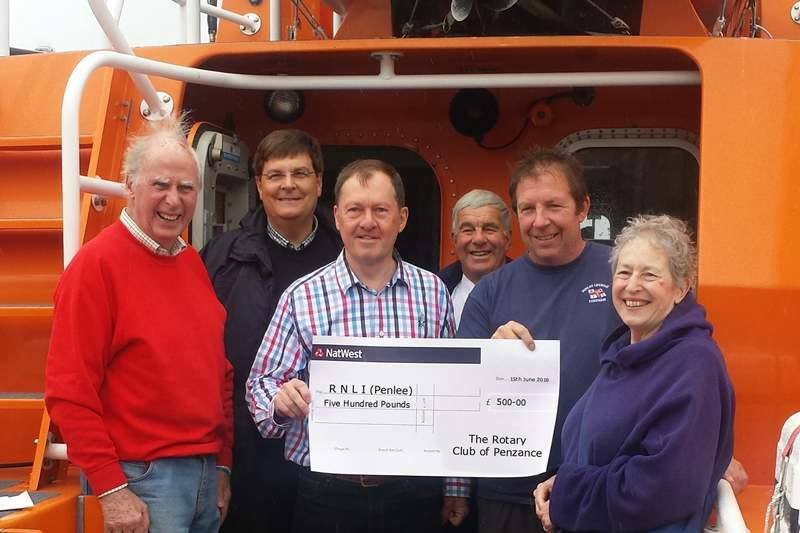 Rotary Club President Jon Symons presents the cheque to RNLI Coxswain Patch Harvey in the company of Rotarians and shop volunteers (L to R Tony Home, Matt Martens, Jon Symons, Des Hosken, Patch Harvey and Sue Home). This presentation is the latest of many awards made to good causes by the Rotary Club of Penzance over recent months. 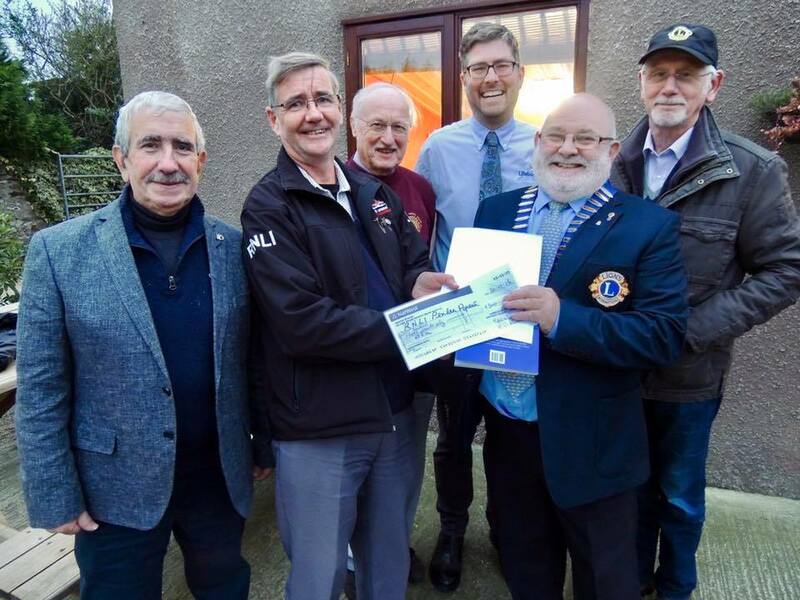 The club is grateful for all the support that it receives and which enables the Rotary Club of Penzance in turn to support many local community groups and charities. We did it! Thank you to everyone that voted for us in the Cornwall Community Cashback Scheme. 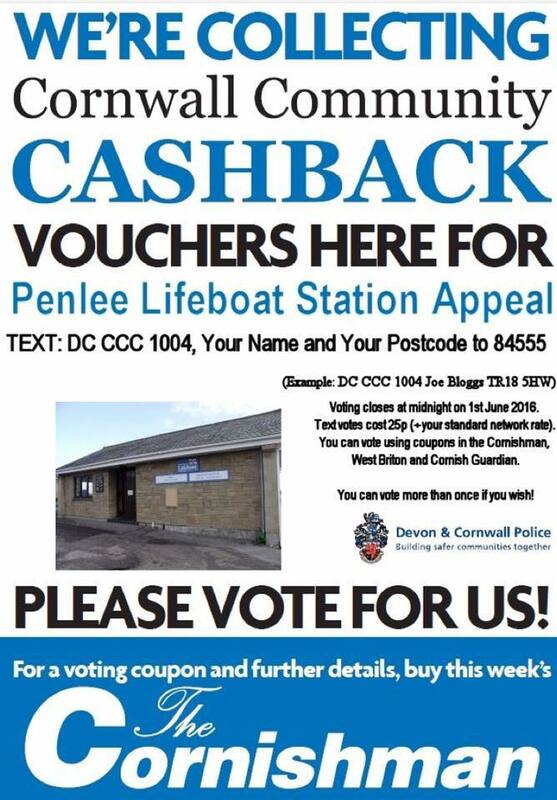 Thanks also to the Devon & Cornwall Police & The Cornishman for giving the Penlee Lifeboat Station Appeal a chance to win this money. 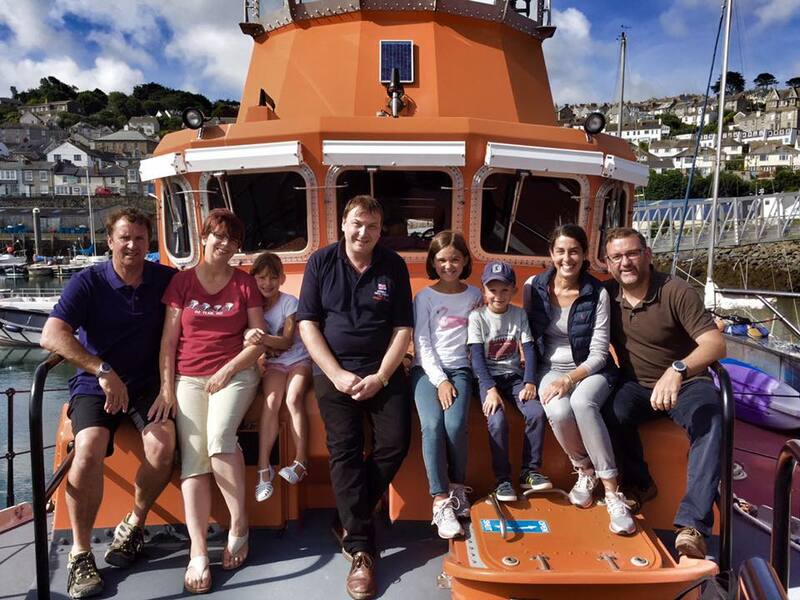 The half term holiday proved not to be a holiday for our volunteer crew. 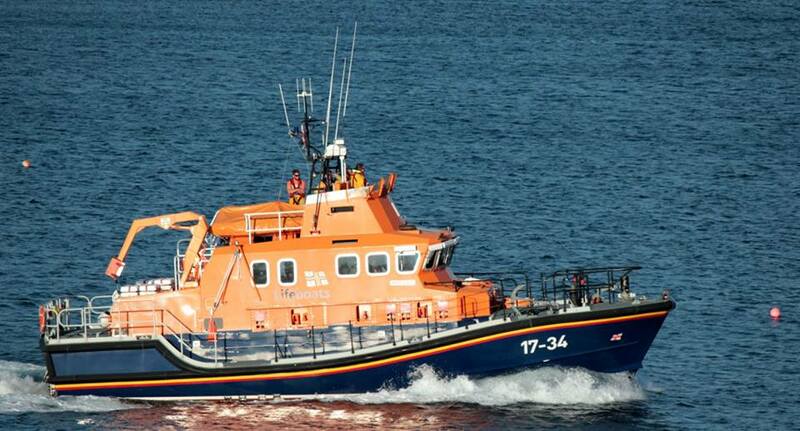 In seven days they launched the Penlee lifeboats seven times. 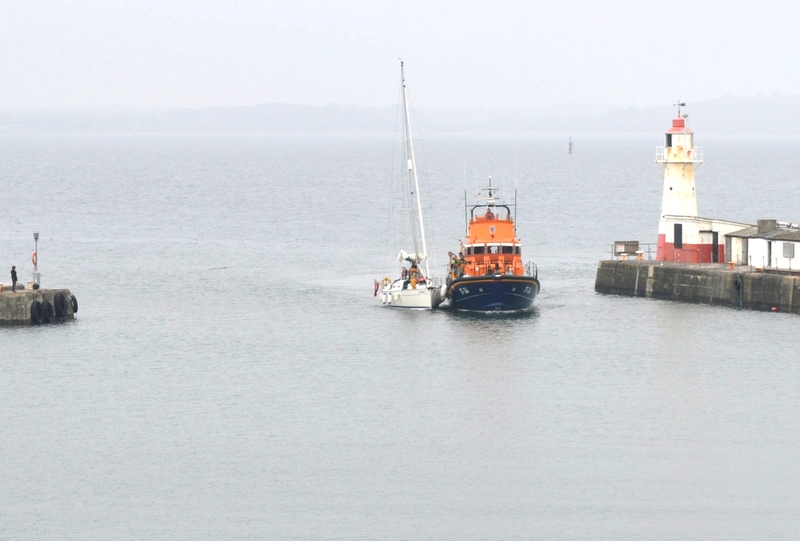 first picking up a tow of the yacht 'Violet Flame' from St.Ives lifeboat. A few days later launched to the aid of a Kite Surfer near Gear Pole. 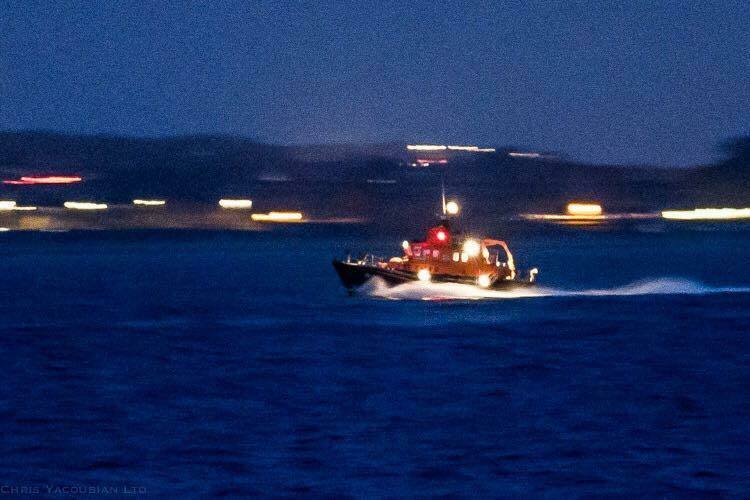 Then very next day both Penlee Lifeboats launched at just after midnight to conduct a shoreline search between Penzance Harbour and St Michaels Mount for a missing person. 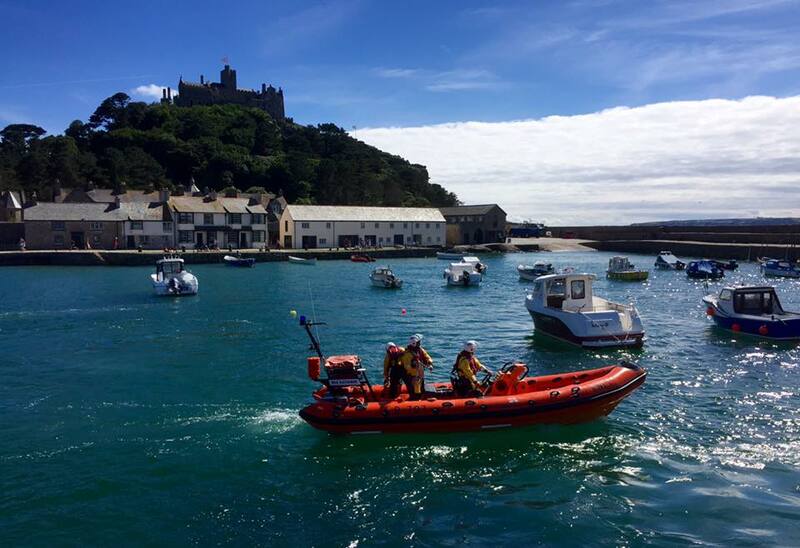 Later that morning the ILB launched to the assistance of a capsized speedboat just off Marazion. 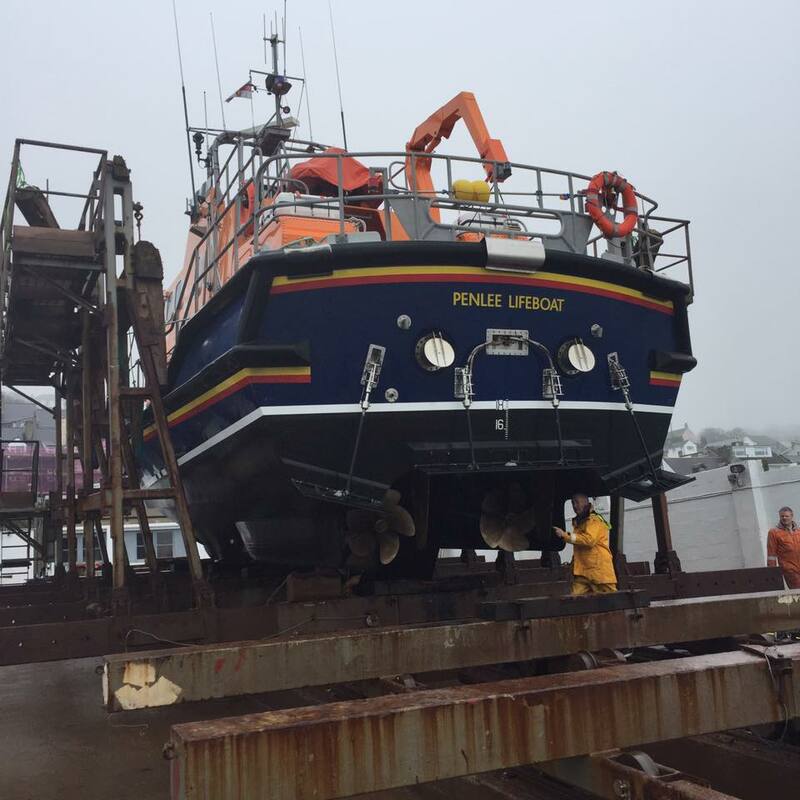 Two launches the following day, the first to the aid of a fishing boat, the second to tow a yacht with engine problems and no wind from Lamorna cove area. Each time the pagers go off there is a rush to get to the station and always more volunteers than needed. Thanks to our very dedicated crew and their very understanding families. Following months of planning and thousands of hours of hard work, the doors of St.Mary's church opened for 5 days for the 'Spirit of Mount's Bay' Festival. There was loads to do and see all celebrating what's great about Mounts Bay. 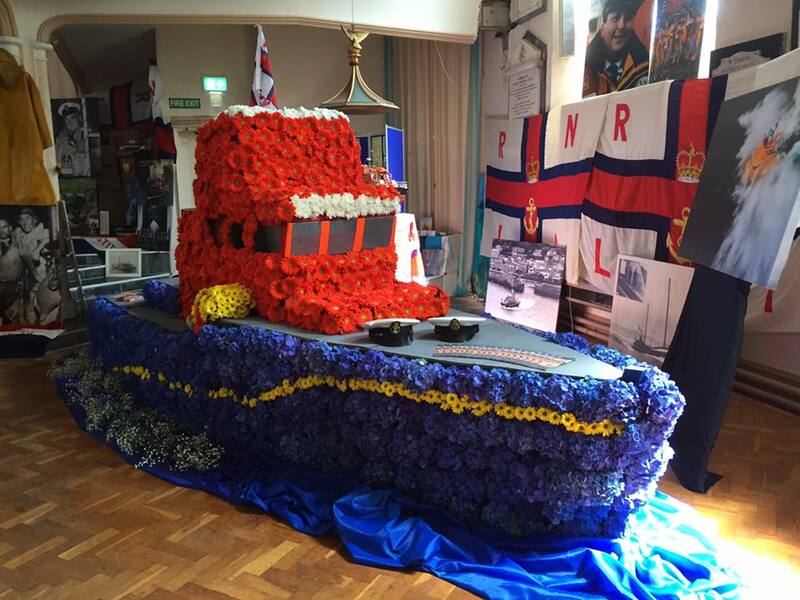 Children's activity area, refreshments from The Quirky Bird Café, exhibitions, floral displays, a Penlee heritage area and our very own Penlee lifeboat 'Ivan Ellen' in stunning flowers. Entry was free, but the collecting boxes were out and a good deal was raised to be split between the Penlee appeal and the youth support activities the Penlee cluster churches run. In just under 2 months we have increased our followers by 1,000 taking our total to over 15,000. Thank you for taking the time to give us your 'thumbs up' and for spreading the word. We at Penlee are very lucky, there are a lot of eyes (and lenses) following our every move and you do take some stunning images of us in action. If you do manage to catch a shot of us, please send them to us by posting them on our FaceBook page. They add to our ever growing heritage collection and in years to come the new teams volunteering for the lifeboat will have a very rich image gallery to choose from for displays! A game full of fun with high quality rugby being played. 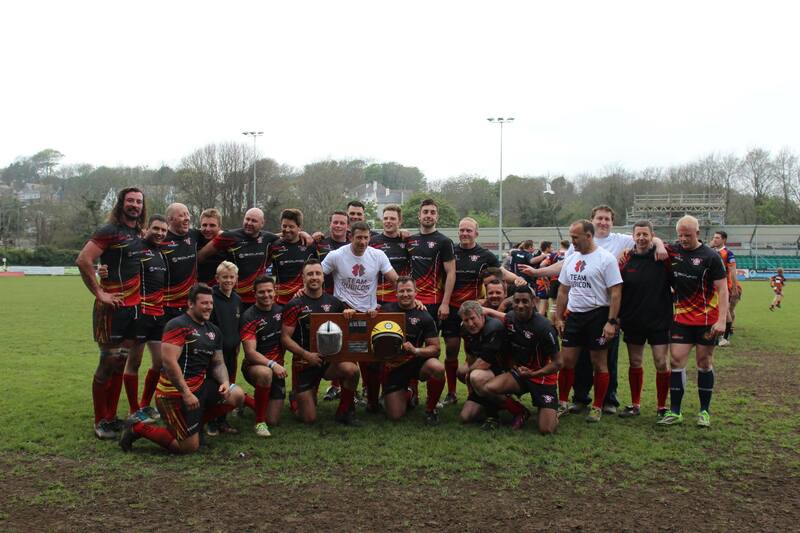 This year the Fire Service beat the RNLI 55-14 win. The 2.30pm kick-off saw a great number of players and supporters at the Mennaye field, Penzance. Home of Penwith's Rugby didn't disappoint those who braved the weather, with a match to remember and cheering so load you could almost hear it in England! During the match collections, entrance donations, Post match raffle and auction raising a staggering amount for charity. Three great causes will benefit - The Penlee Lifeboat Station Appeal, replacing the old station at Newlyn with a modern facility, The Fire Fighters Charity, providing rehabilitation & support services to ill or injured Firefighters, and Team Rubicon UK who provide emergency response teams to disaster zones across the world. Thanks you to all those who attended, supported, played, donated (Especially auction and raffle prizes) and to the Penzance and Newlyn RFC (Pirates rugby club) for allowing us to use the grounds and clubhouse once again. 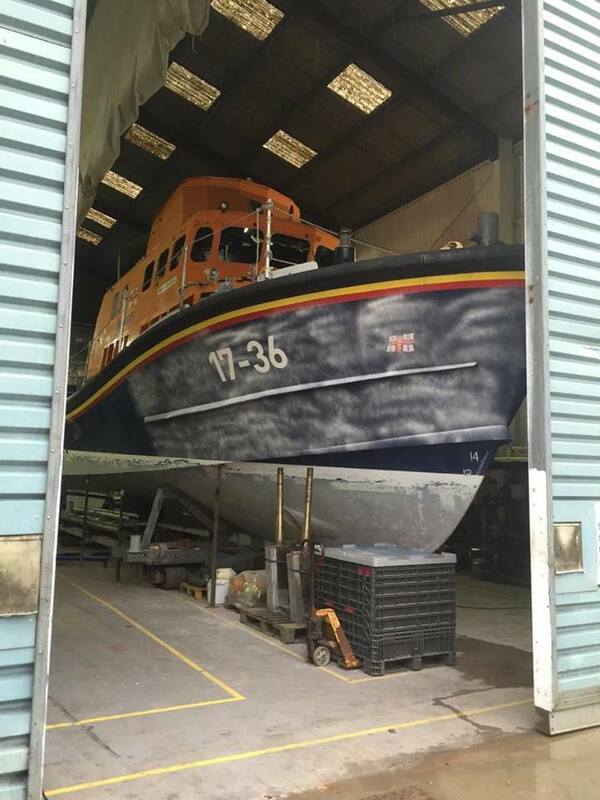 We will soon be welcoming to Penlee a new Atlantic 85 Inshore lifeboat. She is going to be called the 'Mollie and Ivor Dent' and replaces the well loved 'Paul Alexander'. The Paul Alexander has served us at Penlee for 13 years and during her time rescued many people. The RNLI constructs up to 60% of the lifeboats it needs in its own purpose-built manufacturing facility, the Inshore Lifeboat Centre (ILC) in East Cowes.Fifty lifeboats are now constructed at the centre each year, while up to 200 are serviced and refurbished. 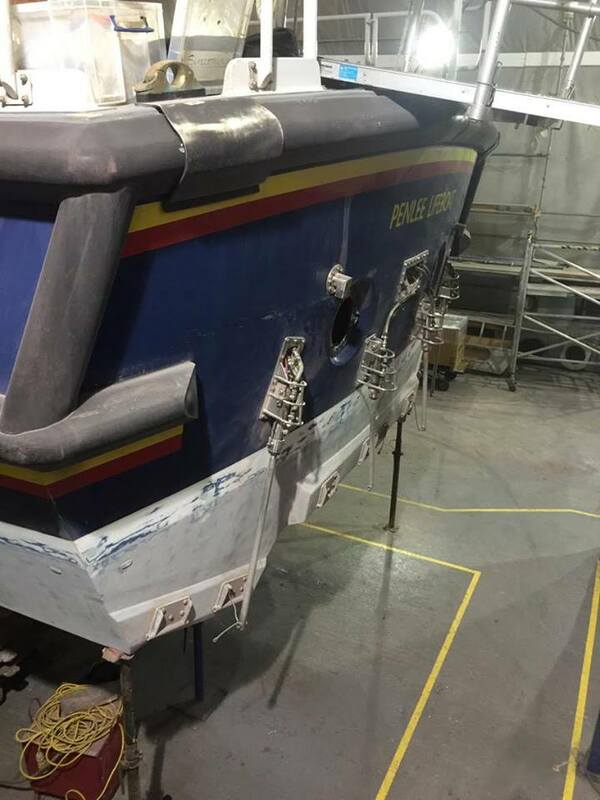 The Photos taken by Penlee Station Mechanic, Tony Rendle, show the construction of the RNLB 'Mollie and Ivor Dent'. Estimated delivery to Penlee after the summer. We were really pleased to welcome Widow Wonkey and the very colourful cast of the Porthenys Players to the station on the Morning of Sat 16th April. 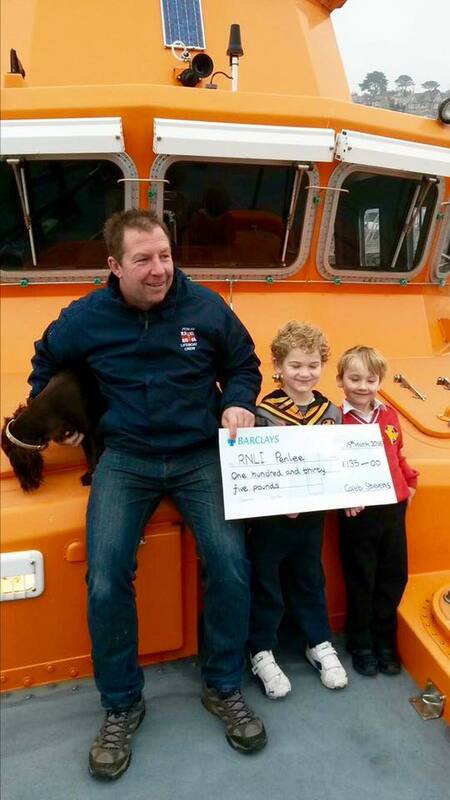 They presented Coxswain Patch Harvey with a cheque for £1,000 which will go to our appeal fund. 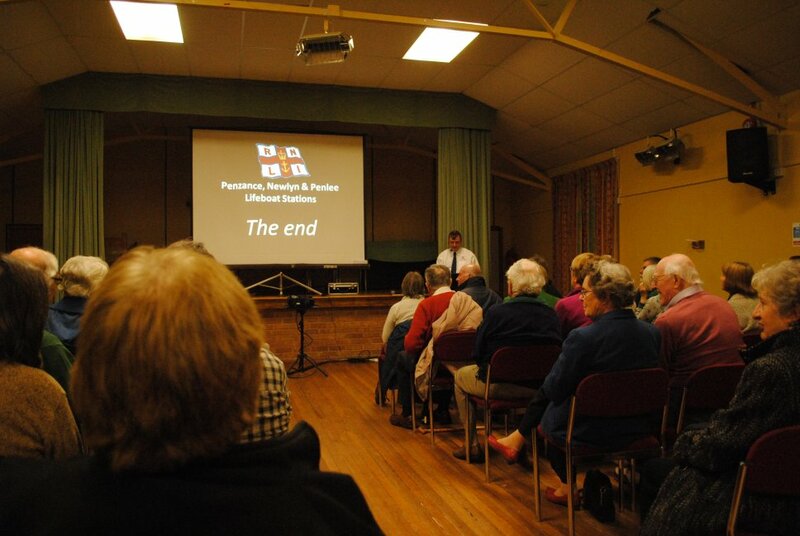 Our Penlee Lifeboat Visits Officer, Martin Brockman, travelled to Malvern to give his heritage talk. Malvern has a thriving RNLI fundraising branch who collect thousands of pounds each year to support the RNLI, despite them being 'Land-locked'. 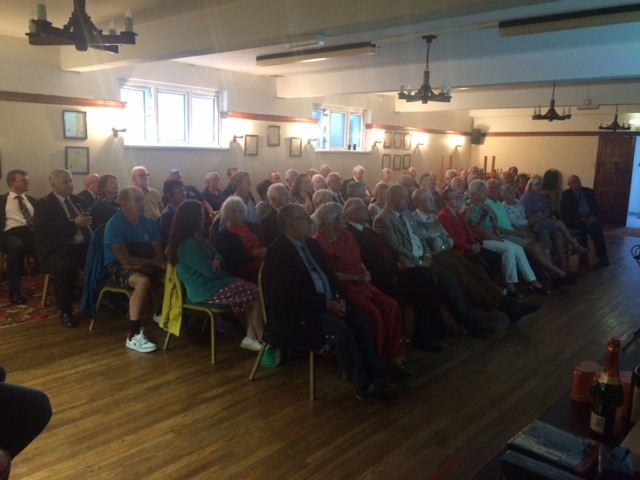 Martin gave his heritage talk to around 70 people and in return they collected £460 towards our appeal. 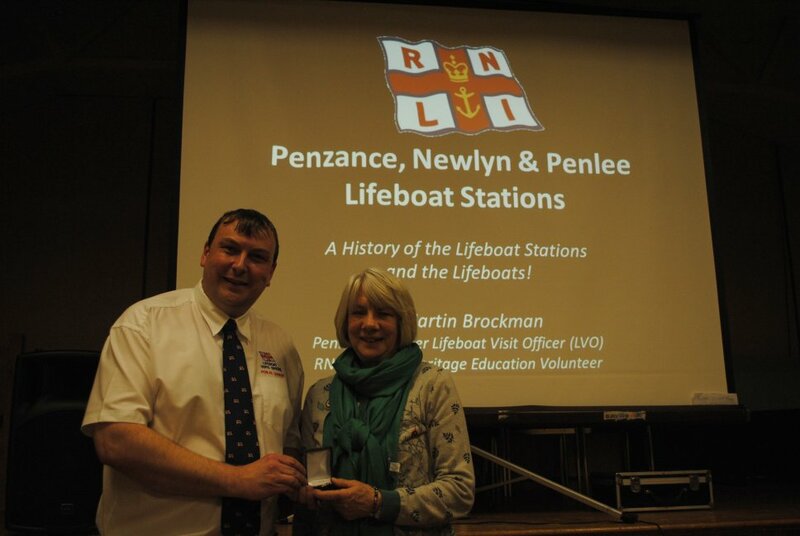 Whilst there Martin had the honour of presenting long time RNLI supporter, Josie Lowe, with her Bronze Badge. 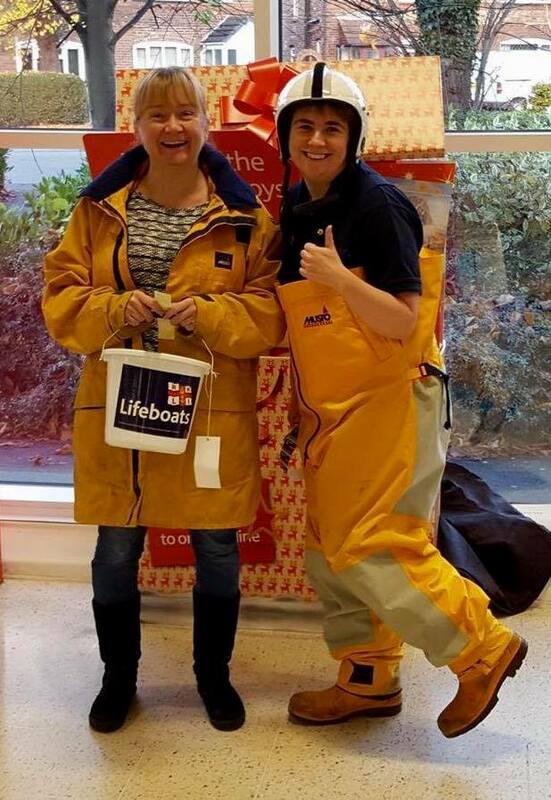 This honour marks Josie's incredible support where she has sold in excess of £20,000 of RNLI merchandise and given thousands of hours to the RNLI helping organise lots of the Malvern fundraising activities. Martin stated that 'It was more than an honour to present the RNLI bronze Badge to Josie. The dedication that the RNLI volunteers give is extremely important to keeping our vital service running and all of those who volunteer, even just a few hours per year should be proud of what they help achieve." 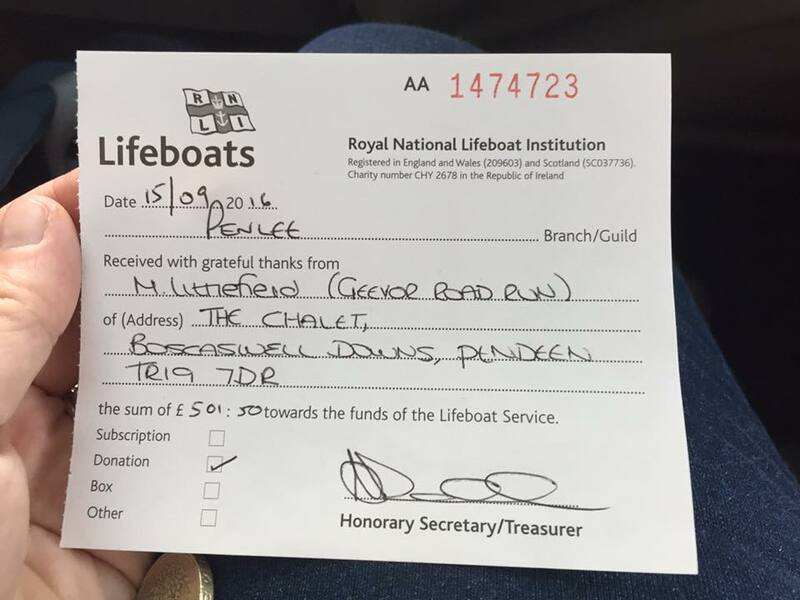 Well done Josie and all of those at the Malvern RNLI Branch. We are so proud of our crowd! If you would like Martin to present one of his heritage talks to your community group, then please contact us in the contacts section of this website - please be aware, he's extremely busy and booked up right until the end of 2016. 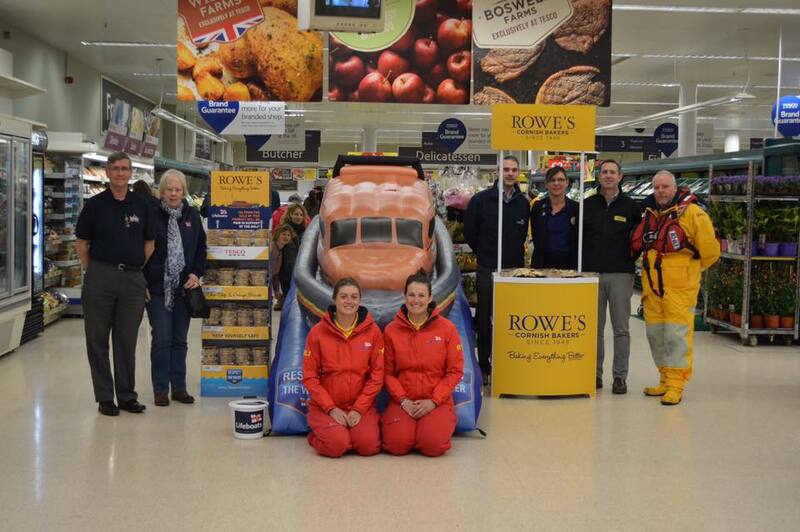 Penlee fundraisers helped launch the Rowe's Bakery RNLI fundraising biscuits at the Tesco Store, Penzance in 8th April 2016. 10p from each pack sold will go to the RNLI. Our volunteers also collected £108.77 towards the Penlee fundraising pot. Our beloved 'Ivan Ellen' is away from us at the moment on the Isle of White having a 7 year refit. This involves a strip-down of the boat and a rebuild from the bottom up. Most things will be changed and when she returns to us, she will be like a new boat. 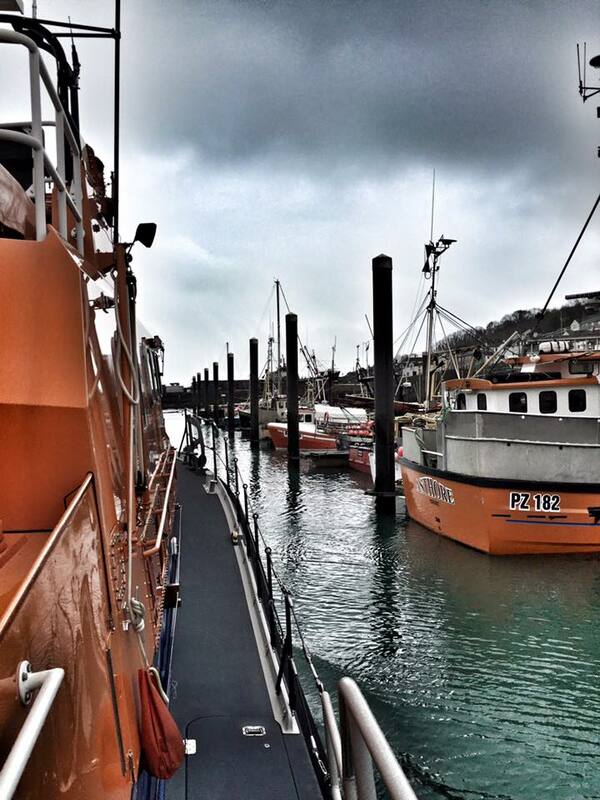 In the meantime the reserve fleet RNLB 'Osier' keeps watch in Newlyn. They are a great company who fundraise & support us and other lifeboat stations throughout the year. 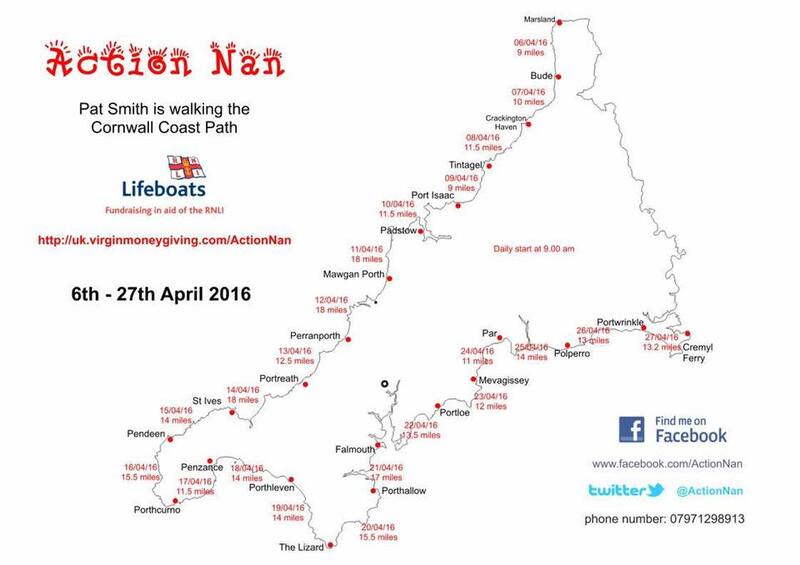 'Action Nan', Pat Smith will be enjoying lots of wonderful views as she walks around the stunning Cornish coastline. Please come and share some of those views and join Pat for a few steps along the way! Our 4th Open Day at the old lifeboat station in Mousehole was another resounding success with 278 visitors coming through the door and sharing our station history. Generous donations totalling £371.27 were collected. 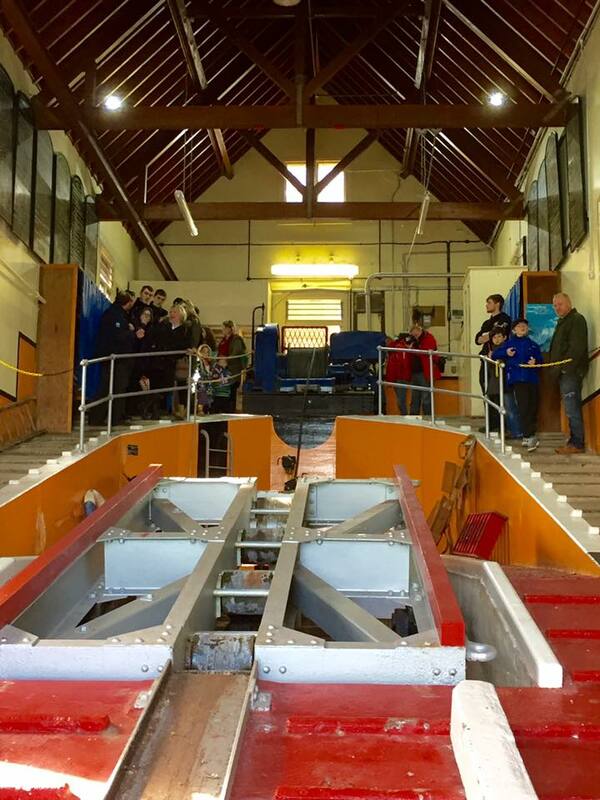 We were pleased to welcome our colleagues from Bude RNLI who made a special trip to see the boathouse. Two special visitors were Benjamin & Corey, Great Grandsons of our late, long serving Mechanic, Johnny Drew, who brought along his mechanics cap for us to see. Johnny was the mechanic at Penlee for 32 years. 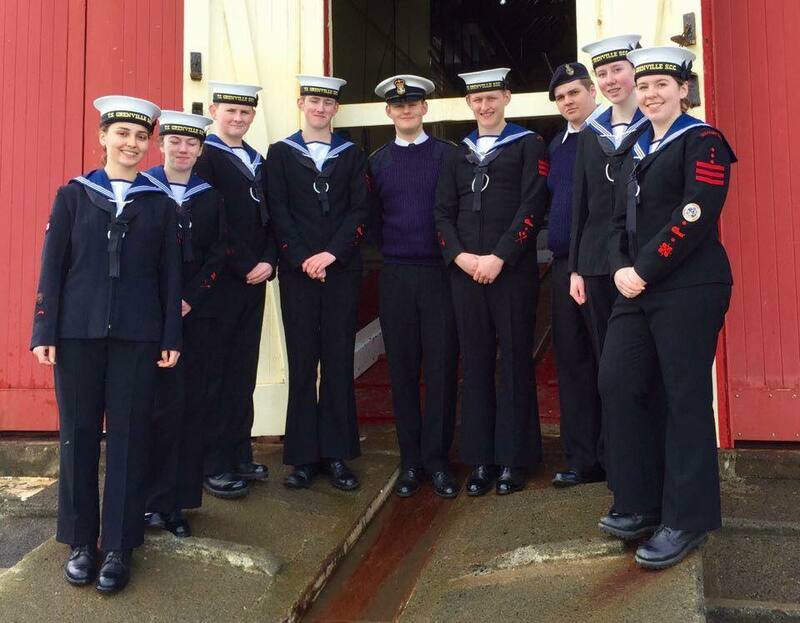 Our thanks must go to everyone who visited, and to the Penzance Sea Cadets who helped us out so admirably. We were thrilled to welcome Caleb onboard the 'Osier' lifeboat yesterday, where he presented a cheque to Coxswain Patch Harvey, and his dog, Mabel. As part of his class topic, 'What can I do to make a positive impact' Caleb challenged himself to swim 20 lengths of Penzance Swimming Pool, asking his friends and family to sponsor him. He raised an amazing £135.00 and wanted to donate the money to help fund our new lifeboat station. Well done & thank you Caleb. You're an inspiration, and an absolute credit to your family, school, and to our lifeboat community. 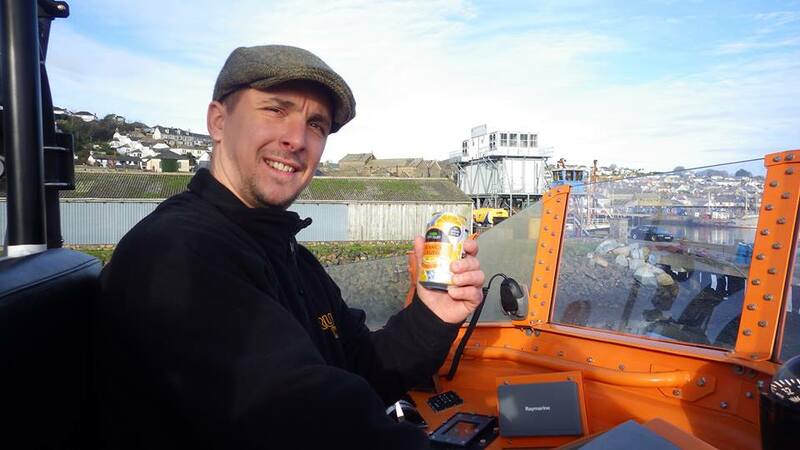 Donations are flooding into our appeal in memory of RNLI volunteer, Nathan Dale, who was tragically killed during the early hours of Saturday morning whilst cycling home after attending the Plymouth lifeboat station. David Lister, Plymouth RNLI Volunteer Lifeboat Operations Manager, said: "I am deeply saddened to hear about the tragic death of one of our volunteers, Nathan Dale and the thoughts of everyone at Plymouth Lifeboat Station are with his family and friends at this difficult time. 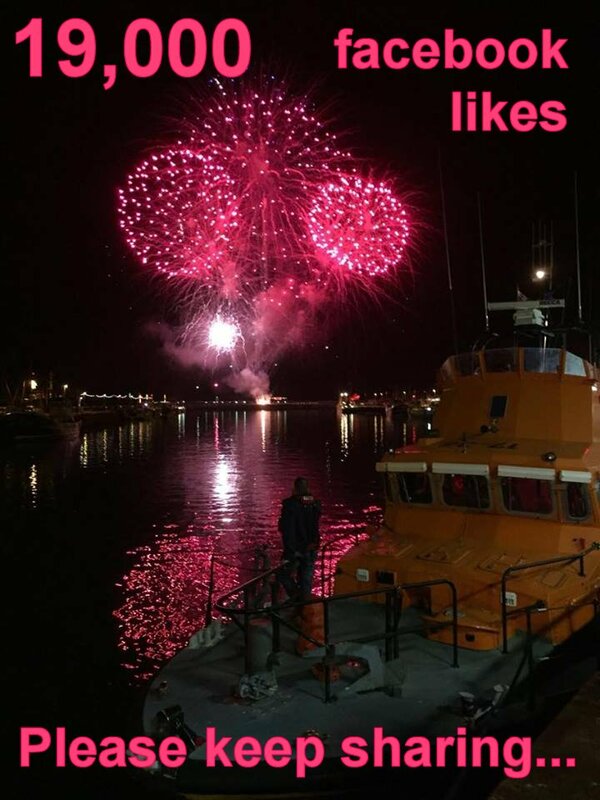 Nathan was a volunteer deputy launching authority with Plymouth RNLI and had been with the station for two years, providing on-call cover one weekend a month. Not only did Nathan dedicate his time to the operation of the lifeboat, he was also involved with many fundraising events at the station, as well as volunteering with other charities. 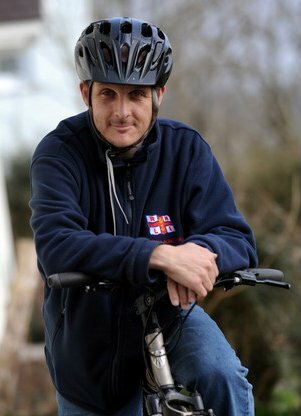 Last year Nathan announced he was taking on an 88-mile challenge, riding his bicycle from His Plymouth Home to Land's End in Cornwall, to help raise funds for the Penlee lifeboat station. His aim was to raise around £4,000 towards the costs of a new boathouse, estimated to be around £200,000." The 'Saturday Gang' held another fundraising Coffee Morning for Penlee at The Godolphin Arms, Marazion on Saturday 12th March. As usual there was a great turn out to support the 'Saturday Club'. This wonderful group of people raised another £450 towards our appeal - an amazing amount of money to raise in just two hours! We were pleased to welcome Rob Lawrance to the station. Well done Rob and a big thank you from us all. 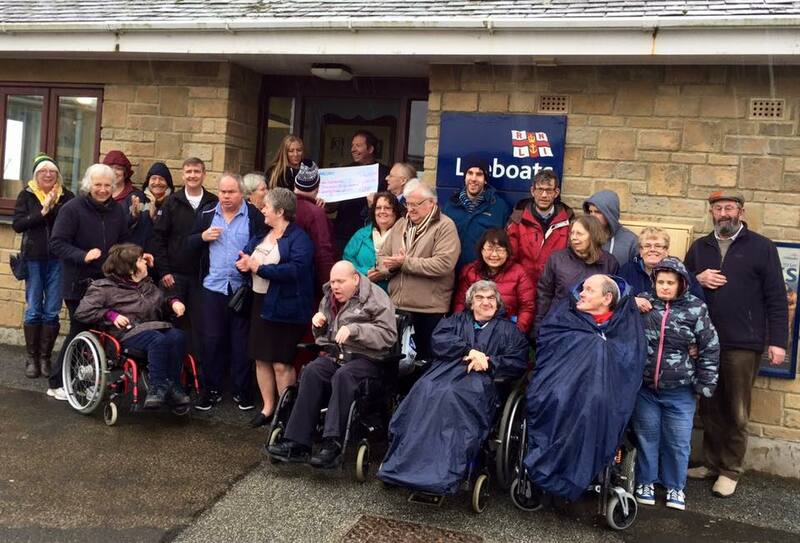 On Sat 20th February we welcomed Penzance and Mounts Bay Sailing Clubs to the old lifeboat house at Penlee point. 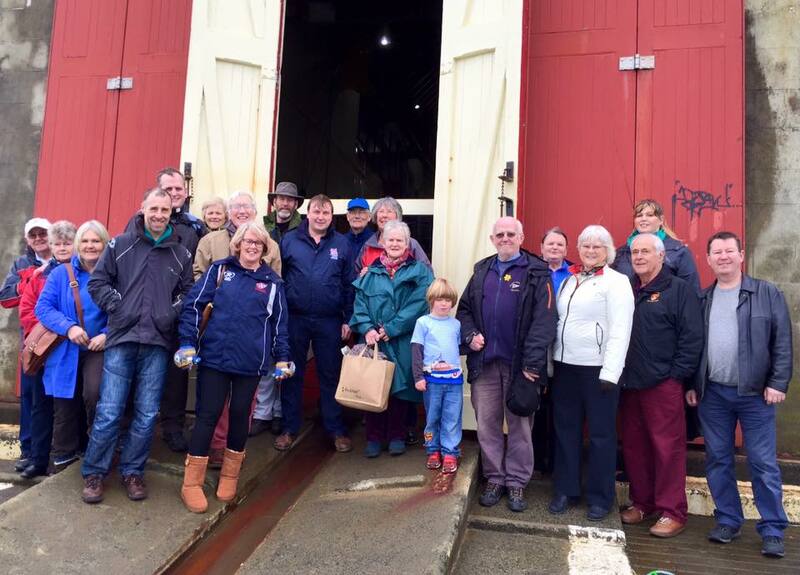 The group were entertained by our Visits Officer, Martin Brockman, and our Press Officer, Elaine Trethowan, who shared lifeboat stories and the history of our station. 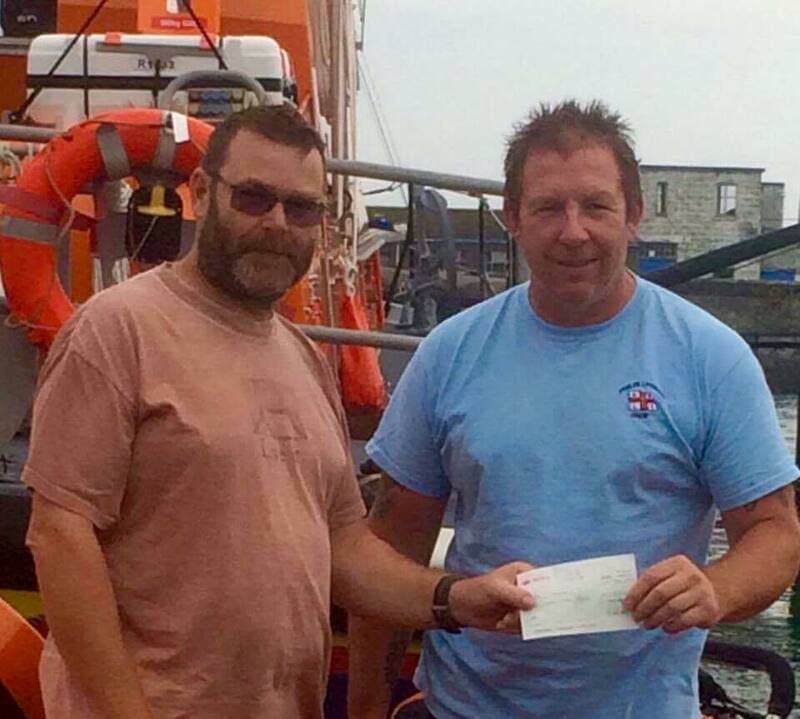 A cheque for £632 was presented to Martin - this money was raised at a dinner & dance hosted by both clubs and will go to the Penlee Lifeboat Station Appeal. We really appreciate this generous donation. 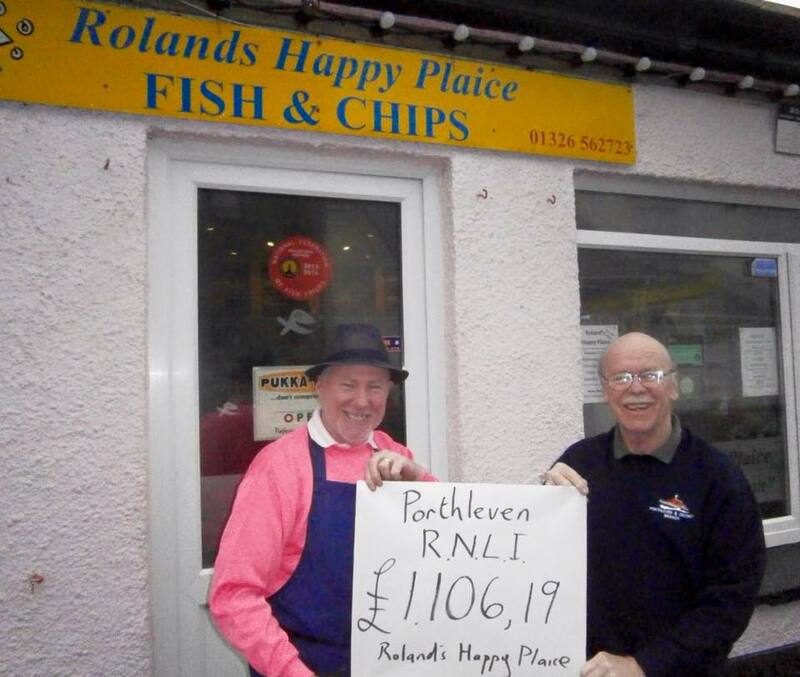 Well done and a big thank you to Rowland Lowery of Roland's Happy Plaice fish & chips in Porthleven. 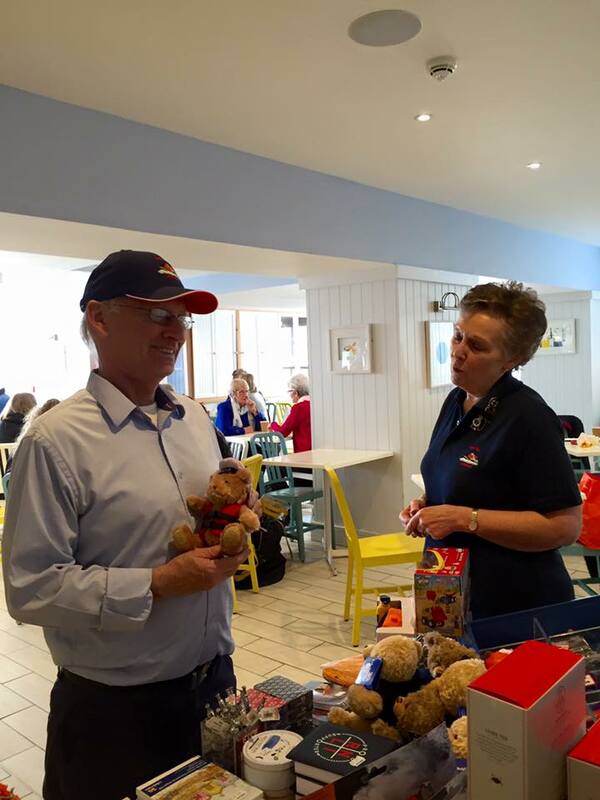 Roland handed over a magnificent £1,106.19 which was collected from his customers who willingly and generously donated their loose change to Roland's counter-top RNLI collection bucket. 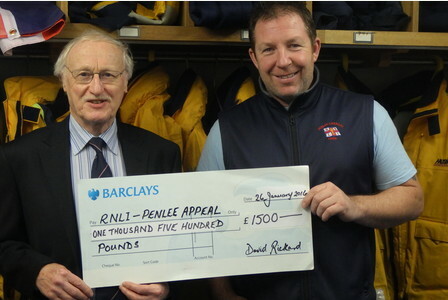 All the money raised by Roland will go to the Penlee Lifeboat Station Appeal. So very proud of our crowd! 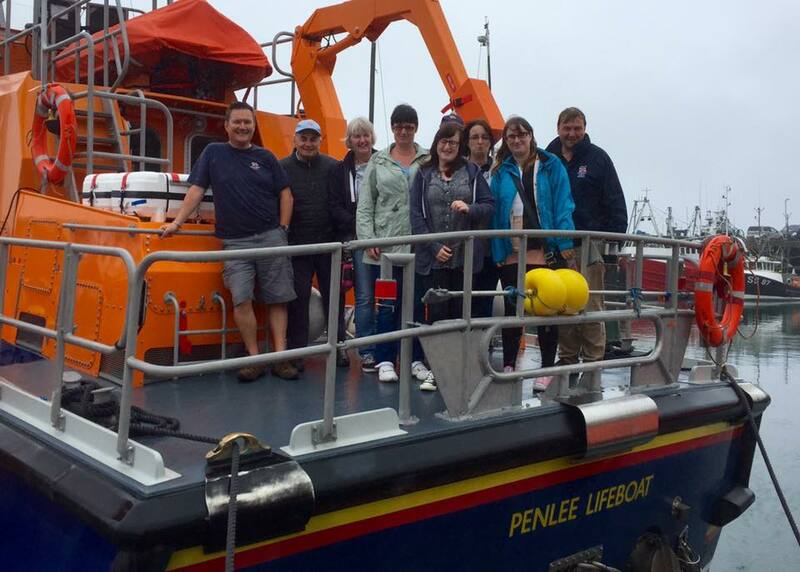 We were thrilled to welcome the 'Saturday Gang' to Penlee Lifeboat Station. This wonderful bunch of people meet every Saturday morning at The Godolphin Arms in Marazion. In November 2015 they held a coffee morning & auction and raised an amazing £1,343 for our appeal. There was a great deal of excitement about the visit. Despite the pouring rain, everyone enjoyed going onboard the Ivan Ellen lifeboat. 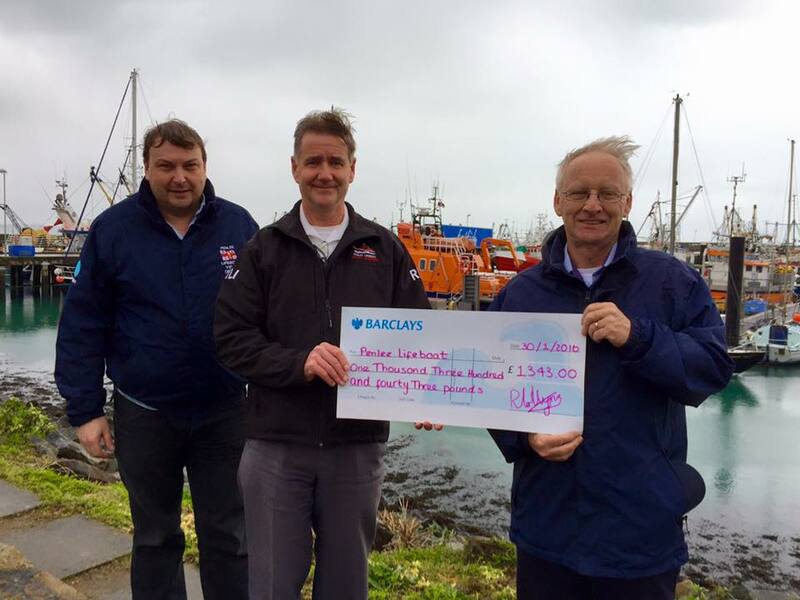 The cheque was presented to Coxswain Patch Harvey by Geoffrey Pearce and a short speech was made by Maurice Shurmer. The 'Saturday Gang' will hold their next fundraising coffee morning at The Godolphin Arms, Marazion from 10am until 1.00pm on Saturday 16th April - raising money for the Fishermans Mission. 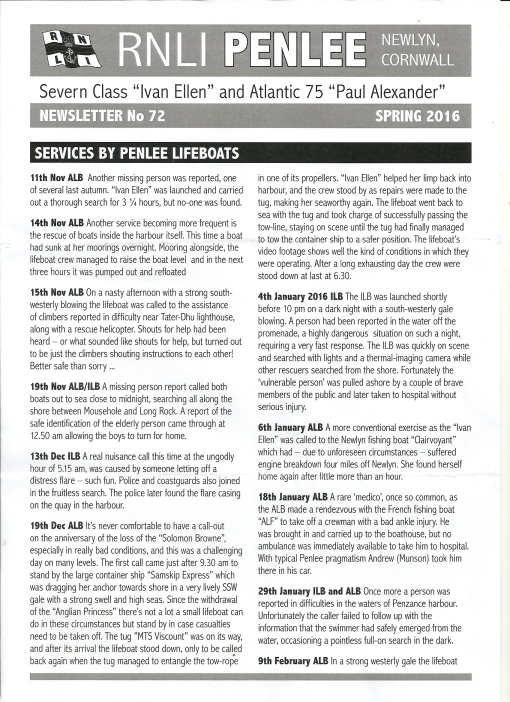 In 2015 Penlee launched 63 times (36 Ivan Ellen and 27 Paul Alexander), we assisted 86 persons and saved 2 lives. Our volunteer crew spent a total of 519 hours at sea in service with 25 of those services in the dark. The busiest stations in the Southwest were Poole and Plymouth both launching 99 times each. Falmouth launched to 84 services, Newquay to 81 and Penlee to 63 being the three busiest in Cornwall. What is the main reason why people end up in the water? • Around half the people who drown never expected to get wet – many get caught out by unexpected slips, trips and falls into the water. • The water is unpredictable; cold water shock can set in instantly. Have fun but stay safe and always Respect the Water. David Rickard, from Honiton, is still doing his weekly paper round every week and he has donated another chunk of his earnings to the Penlee Station Appeal. This is not the first donation, in 2015 David, who is in his 70's, gave us a cheque for £1,000. Many thanks to David and it's great to hear you're still doing your paper round! 41 years ago, on the 25th January 1975, during the hours of darkness, the Penlee Lifeboat 'Solomon Browne' launched from Penlee Point and went to the assistance of the motor vessel 'Lovat' who had put out a Mayday call that her crew were abandoning ship. The 'Lovat' was reported to be 24 miles from Lizard point in horrendous weather conditions. 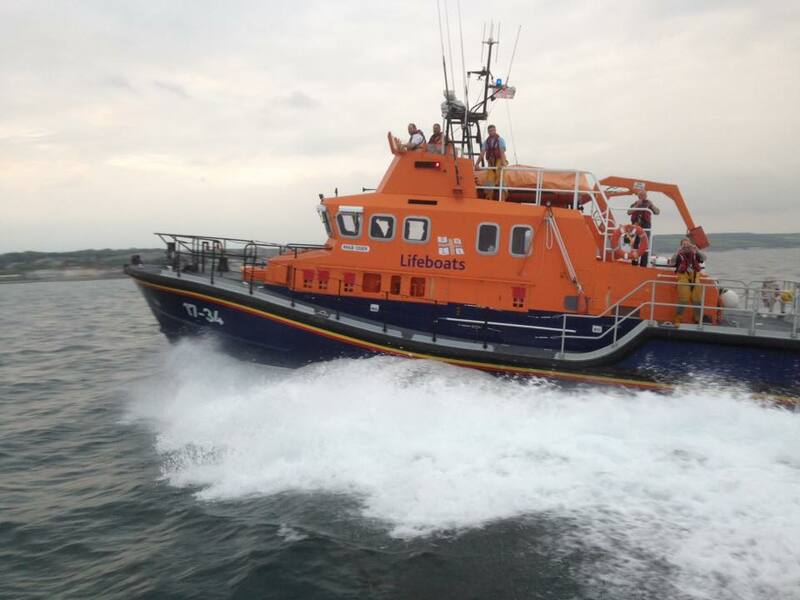 The lifeboat launched down the slip into a full west-north-westerly gale gusting to hurricane force 12. As the 'Solomon Browne' progressed towards the 'Lovat' her passage became extremely uncomfortable with heavy rolling and drastically reduced visibility. Due to the extreme urgency of the situation, Coxswain Trevelyan Richards drove her hard at full speed - in his words, 'It was the worst seas I have ever experienced'. By the time the Solomon Browne got on scene, helicopters had rescued the only 2 survivors but sadly 11 lives were lost. The unhappy & dangerous task of recovering the bodies fell to the crew of the lifeboat who were still battling hurricane force conditions. For his gallantry, courage and skill, Coxswain Trevelyan William Richards was awarded the RNLI's bronze medal. 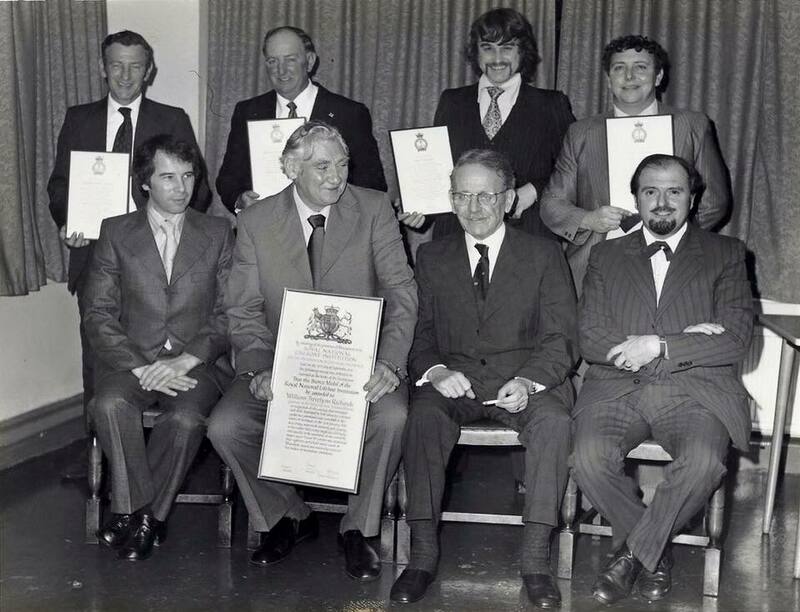 His crew, Frank Wallis (2nd Coxswain), Nigel Brockman, Stephen Madron, Phil Wallis, Barrie Torrie, Alan Tregenza and Kevin Smith were each presented with medal service certificates. On Sat 16th Jan we welcomed Penzance Sailing Club to the station. A tour was given of the lifeboat and facilities lead by Cox, Patch Harvey, and Lifeboat Visits Officer, Martin Brockman. The members of the sailing club are great supporters of Penlee and are always there to assist with sea safety at our fundraising events. Lets hope they don't have to see the lifeboat up close again! The Inshore lifeboat 'Paul Alexander', pictured here at Porthleven, arrived at Penlee Lifeboat Station in 2003 - it seems like only yesterday, and completely transformed the station's capabilities. 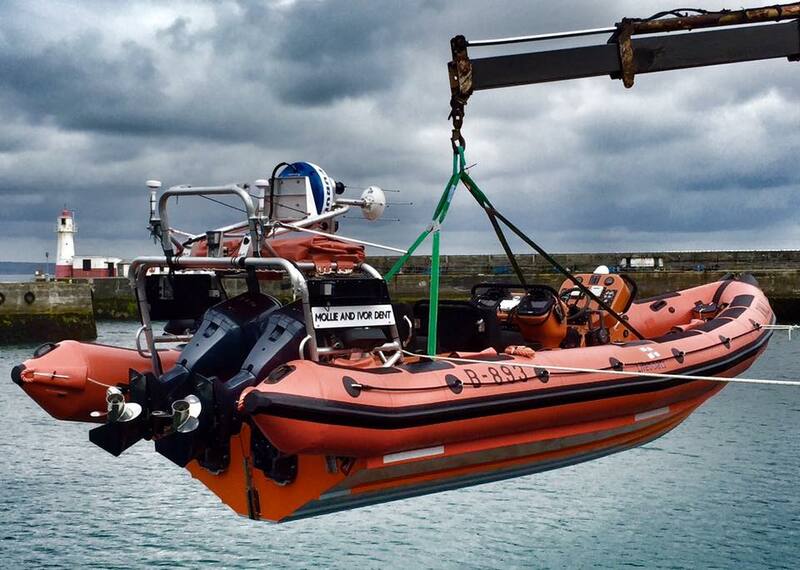 We will be welcoming a new Inshore lifeboat to Penlee late this summer. It will be a bigger and faster Atlantic 85 - to be named the 'Mollie and Ivor Dent' after a legacy from the late Mollie Dent, a lifetime supporter of the RNLI from Newbury. It will be a great asset to the station, though no-one at Penlee will forget Paul Alexander or the exceptional kindness of his family. 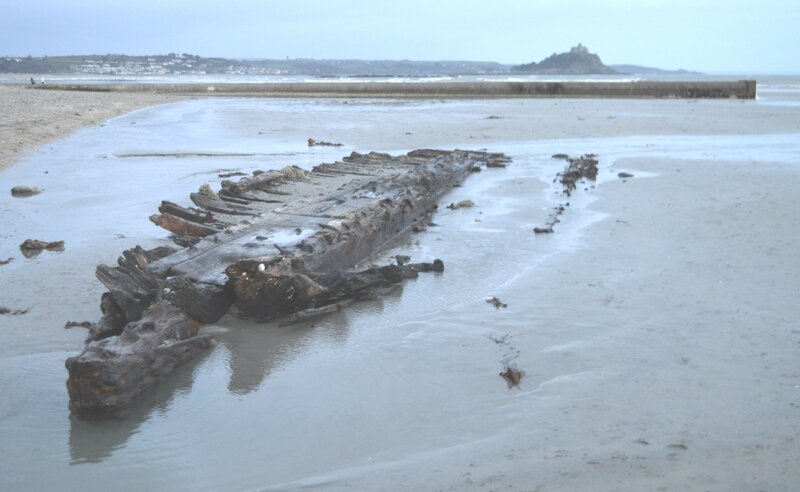 Recent storms in Mount's Bay have once again exposed the likely remains of the French schooner 'Jeune Hortense' which ran aground at Long Rock almost 130 years ago. She was swept ashore in a strong gale on May 17, 1888. 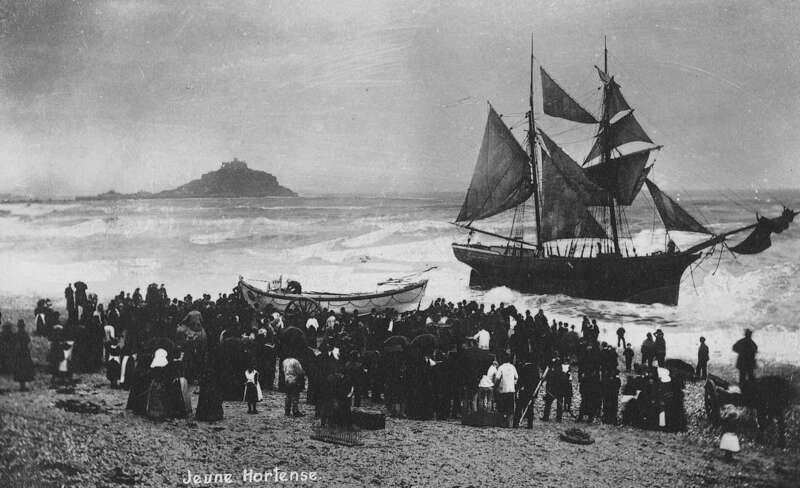 The Penzance lifeboat 'Dora' , one of the early lifeboats which covered Mount's Bay, went to her assistance with the crew rowing out through the heavy waves and swell more than once to rescue the schooner's crew. The 'Dora' ON49 (1884-1895) was a self righting pulling (rowing) lifeboat which cost £363 to build. 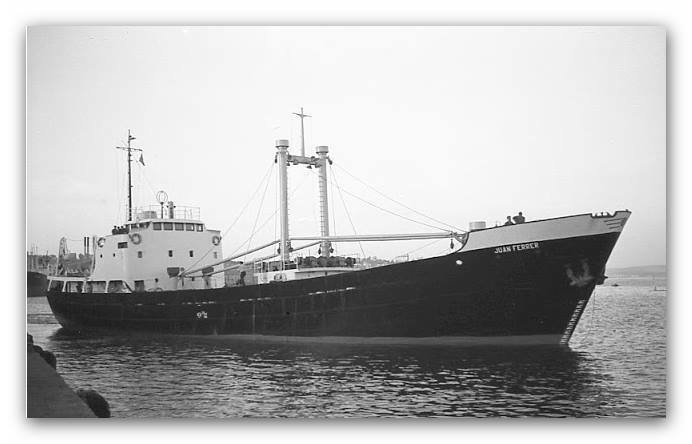 She was 34ft long and 8ft in beam with a crew of 13 and 10 oars. During her service she rescued from 10 vessels saving a total of 57 lives. The Dora was sold out of RNLI service in 1895 but survived until the grand old age of 96 years when she was finally broken up in Ireland in 1980. Registered in England and Wales (209603) and Scotland (SC037736). Charity number CHY 2678 in the Republic of Ireland.